We came to participate in the Sharp-tailed grouse count at the Refuge but� we woke up to � inch of ice covering everything. So we slept in, watched TV then finally ventured out in the elements. We found kingfishers daring the cold and sleet along with various songbirds. Sunday we woke up to five inches of snow and 30mph winds. So we slept in, watched TV etc etc. Monday we woke up to more snow and high winds. 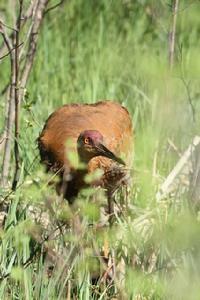 We headed over to the Refuge to leave our �report� for the grouse count. Heading down M-77, we found a pair of Sandhill cranes in front of the south show pool. It was so cool; the male was courting her with his crazy �dance�. She was so ignoring him. The sun came out so we decided to head back to Driggs River Rd. to check out the wildlife. We found buffle heads courting and a pair of golden eyes. The golden eyes are so beautiful. We hated to leave. We wish that it had come out sooner, but better late than never. We took our time going home, anxious to get back soon. On our way up after we were passed Newberry heading to Seney, we spotted a bald eagle perched along the side of the road. Michael turned around, trailer and all, so that I could snap off a few great photos of this beautiful female bald eagle! Sunday we spent the day with the black bears on the Toonerville Trolley. Check out my journal for all the details. Monday we took a walk on the Refuge first to I Pool where we found a pair of loons swimming, peering and feeding like courting loons do. The trumpeter swans were having some territorial problems. We saw one of the F Pool loons. A family of muskrats were out playing on F Pool. It looks like our E Pool eagles may have young. 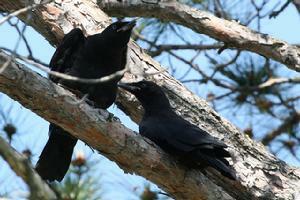 One adult is on the side of the nest and the other is in the tallest pine tree on the island. We will have to investigate further next week when the Refuge opens or ask Sara. 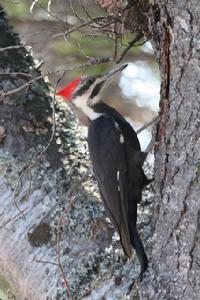 We also had a pileated woodpecker flitting around the Entrance Rd. I was able to snap a couple of photos before it took off. As we are heading down M-77 we spot a mature bald eagle sitting in a tree. A second year eagle takes off and soars around toward us. I am able to get some decent shots before it soars off high in the sky. 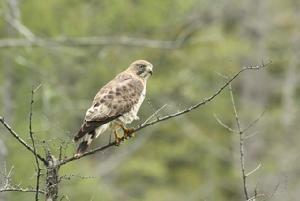 After looking at the photos we discover that it is a female banded on her left leg(Upper Peninsula bird). Could she possibly be Princess from two seasons ago? That would be sweet. Can�t wait till next week Sunday when the Refuge officially opens. It is the opening day for the Refuge and the Visitors Center!! We arrived at 6:45 to find the gate down so we took a little drive down to Germfask. When we arrived back to the Refuge the gate was still down so Michael filmed a pair of ringnecks and I took the nature trail. The wind was really strong but that helped to keep the bugs at bay and blew the clouds off to the south. A great blue heron flew into the small pool in front of the Visitors Center. The trumpeter swans have a big nest on the east side of F -1 behind the Visitors Center. You can get a better view of it from the nature trail. The ospreys look like they are getting ready to nest on F-1. There is several pair of trumpeter swans nesting on I Pool with a little territorial dispute taking place. A Northern Harrier flew over F-1 causing the geese with goslings to panic. Finally, Michael called me and said Sara had the gate opened. She had to go through the Refuge to make sure all of the �authorized personnel only� gates were closed so people wouldn�t get lost J! One of the F Pool loons was near the start of the drive the other was near the start of the Fishing loop. The osprey�s nest on F Pool had an osprey on the nest and one next to it in the trees. I�m not sure if they were really nesting yet or just preparing the nest. 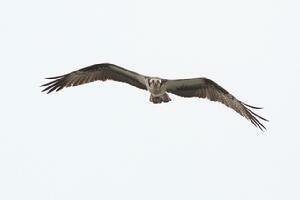 Ospreys return in late spring to Michigan from South America. Therefore, they are later having their young. H Pool had a pair of loons swimming close to the drive which we were filming until a pair of loud fishermen jumped out of their car in front of us to throw their fishing lines in near the loons. Needless to say the loons went further away from the shore L. We spooked up five sharp-tailed grouse on the J/G drive on the west end of the fishing loop. We got to G Pool to find, we think, a new pair of loons. The one that looked like the female had white bands on. Our female from last year had red bands. Unfortunately, our male from last year was found dead on the northern shores of Lake Michigan last fall. This was the pair we filmed all last summer as they incubated and hatched their two chicks. Our G Pool male will always be with us via our loon documentary that we have produced and will publish this summer. Sweet, we now have an eagle�s nest on G Pool. We could see one eaglet which was confirmed by Sara later in the day. Awesome, D Pool loons are nesting! Hope all goes well for them this year. They lost their chick last year shortly after it was hatched. Our ospreys are working around their nest on D Pool. Hopefully, they, too, will have better luck this year. We have one loon swimming around an island on C Pool near their old nest. Maybe they are working on a new nest? We shall see. We took a break and stopped in to see Sara. We just missed Claudia hope to catch up with her next weekend. We are back around 2:00 to take a spin around the Marshland Drive. 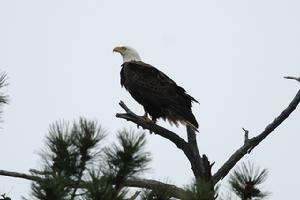 Our E Pool eagle just flew into the big pine tree on their island. The other eagle is in the nest. We could see the two eaglets that Sara reported they had. Sweet!! Hope for some shots of the young after they fledge. When there are two of them, there is usually a lot more squabbling for food. 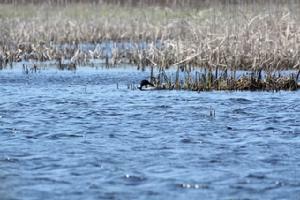 The loons on east end of E Pool are on their nest, too! Hopefully, they don�t get frozen or waterlogged. The west end loons of E Pool are together swimming near the shore further down. West end of C Pool has a pair of loons starting to build a nest on a small island. Could it possibly be our pair from further down on C? We hope to find out. We have a pied bill grebe toward the east end of C Pool. Several Trumpeter swans are nesting on C Pool. 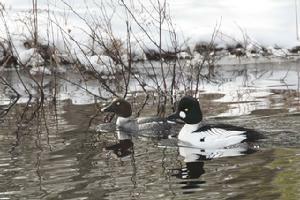 The pair of loons is still together at the east end of C Pool. Not a lot of other critters moving. We saw a few kingfishers which of course we saw in April when it was snowing! We finished our second runaround at 4:00. We both felt very wind damaged so we decided to take a trip in to Munising for a Main Street Pizza fix. On our way back to Seney we finally found some of our favorite Sandhills just as we entered the Refuge�s western boundary. 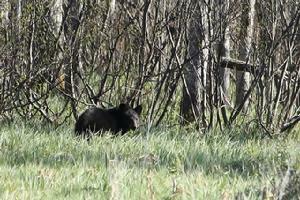 Then just west of Driggs River Rd we spotted a third year black bear out eating grass. I managed to snap a couple of shots of him before he ran back into the brush. Sweet!! So all in all we had a great first day at Seney National Wildlife Refuge!! Till tomorrow. We headed into the Refuge around 7:00am. It is only 32 degrees with a stiff northeast wind. Fairly quiet this morning. I think it is still too cold for the critters to move. 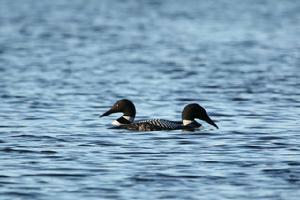 As we head down the Fishing drive we find the loons on H Pool still haven�t nested. We have a pair of blue winged teals together at the west end of H Pool. 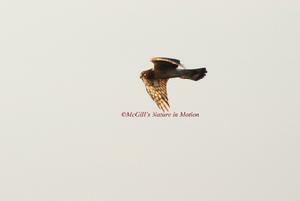 A Northern harrier is flying around in the same area. A lone sandhill crane is on F marsh, possibly a nesting mate? J Pool loons have not nested yet either. As we drive around to G Pool we discover a lone loon has invaded the space. It doesn�t take much for our pair of loons to chase it off to find another home. We don�t see much action at the Eagle�s nest. It is too early and cold for the little ones to get too active. We have a lone loon at the west end of E Pool. It could possibly be the one just ran off by G Pool loons. There seems to be pairs of ringnecks on every pool. Another pair of blue winged teals is in the creek behind D Pool. Kingfishers are squawking around. There always seems to be quite a few on the west end of E Pool. Our D Pool loon is on its nest while the spouse patrols the perimeters. D Pool�s osprey is also on its� nest. Sweet! We will have lots of babies come June! C Pool loon is on its nest that it was building yesterday. Hopefully the waters won�t rise much more or some of the nests will be in trouble. 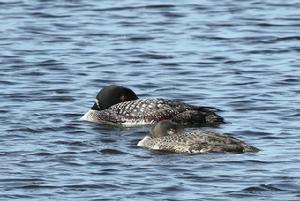 The pair of loons that was at the far end of C Pool is now looking for a home on the small pool to the east. There appears to be plenty of possible nesting places that are secluded. 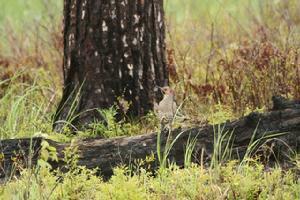 As we are about to leave the Refuge we discover a ruffed grouse right on the edge of the drive. It doesn�t seem notice us. When it finally does notice us it slowly wanders back into the woods. We decide to take a break and see Pat and Sara. When we get to the Visitors Center we discover the gate is closed!!!! We find out from Sara and Mark that they are taking a waterfowl survey so they wanted limited distractions for the birds. It was only going to be closed for an hour or so. We had planned on visiting the girls anyways. Nice to be back with all of our friends at Seney National Wildlife Refuge! We did take a second run through at 12:00 but nothing out of the ordinary (not that loons and eagles are ordinary). So we call it a weekend as we head back to the grind. But we shall return to film another day! <?xml:namespace prefix = o ns = "urn:schemas-microsoft-com:office:office" />We got our trailer settled quickly then headed for a quick run through the Refuge at 8:00pm. The weather was overcast and 68 degrees. The mosquitoes were thick as thick at the park. 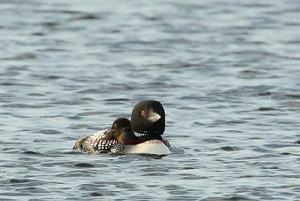 A pair of ring necks was on F Pool along with several trumpeter swans and of course Canadian geese. No sign of ABJ and mate so hopefully they are nesting. Pair of Geese and their four goslings was on E Pool. Momma eagle was standing sentinel on Eagle Island as her two eaglets settle in for the night. Daddy eagle is taking a break from hectic family life. He is sitting in one of his favorite pine trees on the Marshland Drive. He obliged with a few photos before heading back to Eagle Island where he told his wife how rude we were to bother him. He chattered and chattered and chattered. 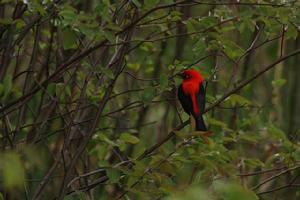 We spotted a beautiful male scarlet tanager in marshy area on C Pool across from the eagle turnout. Further down our east end E Pool loon was on its nest. Yeah!! No sight of the west end loons. Hopefully, they too have started nesting. A beaver was eating midway on E Pool quietly enjoying its evening meal when the kids found him and starting bothering him. The poor parents they are as hassled as their human counterparts. Unfortunately, D Pool loon was not on its nest. Hopefully, it was just taking a quick break. The same for our C Pool loon. They were both on nests last weekend. At the end of C Pool an osprey was fishing. He plunged in, nabbed a fish and headed for home on M-77. The peepers were all singing such a wonderful lullaby. It was a wonderful way to end an evening. Hopefully, the weather will cooperate for part of the day tomorrow at least. <?xml:namespace prefix = o ns = "urn:schemas-microsoft-com:office:office" />It rained all night long so we figured we wouldn�t head in too early to the Refuge. It was still overcast and damp when we headed in around 10:00. The ring neck couple was still in the same area on F Pool. Trumpeter swans and Canadian geese were scattered throughout. The songbirds are very happy with plenty of bugs and worms to dine on. The F Pool osprey is busy fishing.Two loons are swimming and diving on E Pool near the E/F spillway. Two godwits are flitting about. We have one lonely, wet Sandhill just standing in the bushes looking very forlorn. The red-winged blackbirds are singing and carrying on all over the Refuge.Now the F Pool osprey just flew over to H Pool to fish. Bam! He was back in less than a minute with a fish. Awesome fishing, dude! Its� mate was waiting in the nest. 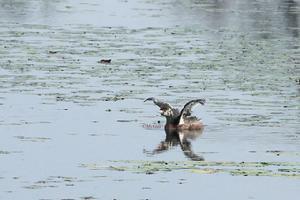 The F-1 osprey was fishing over F Pool but did not have the same kind of luck.The loons are H Pool is still together. So we will have to keep tabs on them. Same goes for the J Pool loons. A few ring necks are scattered here and there. 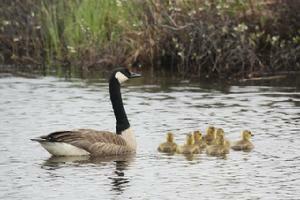 Canadian geese with seven goslings are swimming in the channel. A lone Sandhill crane is flying over H marsh. 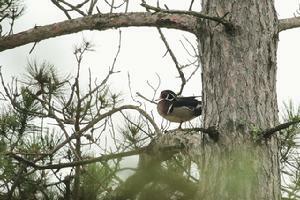 As we near G Pool a male wood duck flies up into a tree. I know that they nest in tree cavities and nest boxes, but I have never actually seen one in a tree. 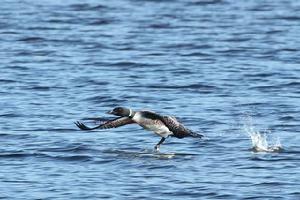 Cool!We finally found some Snipes but they were flying all around G Pool seeming to chase each other in a set pattern. Mating ritual? It went on for some time. G Pool eagle is sitting outside of the nest keeping an eye on its young. G Pool loons are swimming near the old nest sight.The D Pool loons were together but not on the nest they had previously occupied. The osprey is in the nest on D Pool. We have some of our little terns back screaming as they fly.We have a loon on the east end of B Pool as well as two loons on the east end of C Pool. A Northern harrier was hunting over the end of B marsh area. Snipes are calling each other in the marsh at the end of the drive. And our M-77 osprey was back fishing at the end of C Pool.The mist is getting heavier and the skies are getting darker. Think we will head to the trailer for some a break and some lunch. May 22, 2011 pmAfter a three and a half hour break that included a downpour and thunderstorm, the sun is out and so are we.4:00 and 71 degrees with a lovely breeze to help keep the bugs at bay. F Pool loon was swimming around the island in the middle. The Canadian geese with their goslings are out for a Sunday picnic. Every little pool seems to have a little family on it. As we turn on the Fishing loop we discover another loon near the E/F spillway. F Pool osprey was in a tree near the nest where its mate is setting. Our Sandhill is still in the same area as he was this morning.We have a male Northern harrier flying over the J channel area. We notice one of G Pool loons toward the backside of the pool. A Sandhill is alone in the west end of E marsh. It is being very quiet like the one on E Pool. Maybe a nesting mate? D Pool one osprey is in a tree and the other in the nest. Flickers, downy woodpeckers, eastern kingbirds, redwing blackbirds and many other little songbirds are happily singing in the sunshine. I saw something big flapping and flapping its wings in the water at the end of B Pool. On further investigation, it was a bald eagle. He was really struggling with whatever he had caught. An eagle cannot pick up anything heavier than itself. It can drowned if it cannot release the catch soon enough. We were afraid that might happen. But, luckily, as we stopped at the old nest observation deck, it broke free and went into one of the tall pine trees near the old nest. It was visibly shaken and weighted down with water. It stayed for quite some time trying to dry out its wings. Wow!! Glad it turned out as good as it did. There was also a loon nearby calling its mate. I�m sure it too was upset over the eagle�s ordeal. Several terns and many trumpeter swans were being active in the area.The east end of C Pool has a pair of loons on it. A Northern harrier is hunting at the end of the drive. The clouds are once again getting darker as we head into Newberry. Seney Journal May 23, 2011<?xml:namespace prefix = o ns = "urn:schemas-microsoft-com:office:office" />9:30 am it is overcast and misting with temperatures in the 50�s. The Visitors Center is packed with school children from Manistique. We dropped off the calendars Claudia ordered and made a beeline for the Refuge. The ring neck couple is still in the small cove on F Pool. A pair of Sandhill cranes is flying over F Pool to E Pool. The F Pool ospreys are in their designated areas, one on the tree standing sentinel and the other on the nest. Everywhere you look there are geese with goslings and muskrats with sweet grass. 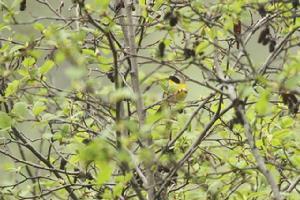 Yellow warblers are serenading and chasing each other in and out of the bushes. We have Wilson snipe calling and flying in and out of F marsh. The flickers are also calling and flying around. A pair of Sandhill cranes is sleeping in the H marsh probably trying to recover from all this miserable weather we have been having. 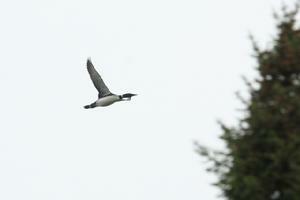 I also shot a quick photo of a golden winged warbler near the bridge on H/J marshes.There are three loons on J Pool. Look like someone wants to have a party. Before too long one is asked to leave so off it goes to find another pool to crash.The terns are back on the island on J Pool. You can hear them even if it is too foggy to see them. We have a spotted sandpiper just past the bridge on H/J. On G Pool the baby eaglet�s profile can be seen in its nest as it waits not so patiently for the return of the parents to feed it. The older the eaglet gets the more the parents will leave them alone in the nest. Our D Pool loons are just swimming and fishing together. Hopefully they will nest again soon. 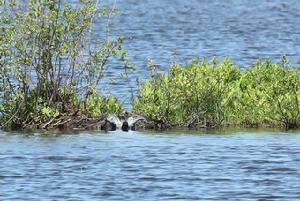 The osprey is in their nest at the end of D Pool.The east end of C Pool has two loons, no make that three. I think we found where the �party� loon went. The C Pool loons just like the J Pool loons sent him packing. There is an osprey fishing on B Pool where twenty plus trumpeter swans are hanging out. There is a little doe in the drive. She heads into B marsh as we approach her. 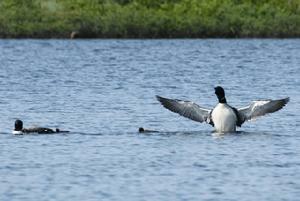 This tends to be one of the areas we do see dear in.As we are heading out of the Refuge, a single loon flies over us. The �party� loon still hunting for a party?We will be back next weekend. Hopefully, we have a little more cooperation from the weather. We had time to make a quick run through the Refuge along with a number of other people. We entered at 8:15pm with the temperature at 55 degrees, extreme wind and sun shining through a hazy sky. The ring neck couple is still on the little pool in front of the Visitors Center. We spot one loon in the middle of F Pool. 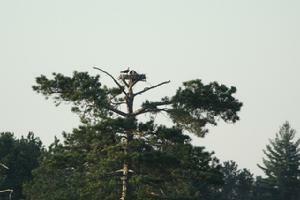 Our E Pool eagle is sitting in the tall pine on Eagle Island watching over its young. Unfortunately, our E Pool loons were off of the nest L.
Two male wood ducks flew off toward the end of E Pool. Trumpeter swans are still nesting throughout the Refuge. One loon is swimming in the middle of D Pool as our osprey is sitting on its nest. We spot a loon flying over B marsh. It eventually circled around and landed on the east end of C Pool. We have a couple of ring necks on C Pool along with a beaver, muskrats and a trumpeter swan. We spot a pair of Sandhills close to the drive on B marsh. On further investigation we discover it to be Frick and the chick. Glad to see they are back on the Refuge. Well, the sun is being swallowed by a front of clouds moving in before it has time to set. We head out of the Refuge at 9:20pm where we spot a pair of Sandhills that had just crossed M-77. We didn�t get to see if they had a baby with them or not. That is for another day. Another rainy night, overcast morning and lots of bugs!! We head into the Refuge around 9:30 with the temperatures at 52 degrees. A Sandhill crane is flying over the Visitors Center. 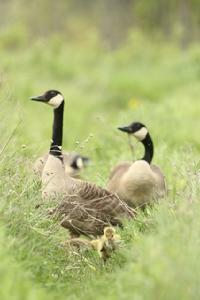 The Canada geese and goslings are everywhere. 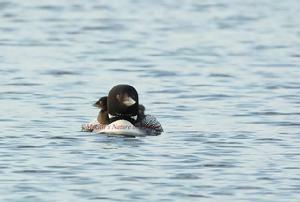 We spot one loon on F Pool. Hopefully, that means the other one is on a nest. The E Pool eagle is guarding its nest of eaglets. The osprey on F Pool is incubating its eggs as its mate is on guard and KP duty. 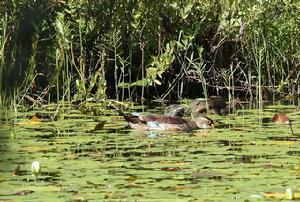 The blue-winged teals are in the marshy area on F along with some Wilson Snipes that are courting. The terns are flying and crying on J Pool on Tern Island. Well, our G Pool loons are not nesting�yet. The G Pool eagle is on the edge of the nest watching its one young. The sun is trying to break through. Our D Pool osprey is on its nest with its mate watching nearby. Not sign of the loons. A harrier is flying over B marsh. A doe is in the marshes on C Pool. An osprey is fishing over C Pool. Our C Pool loons are together near the C/B spillway where a kingfisher is looking like it may be trying to dig its nest out. We have ring neck couples still together throughout the Refuge. 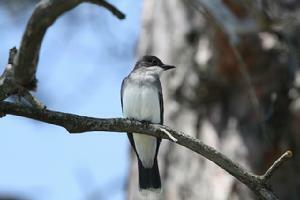 Eastern kingbirds are fighting and carrying on everywhere. They are so cute to watch. As we leave the Refuge around 12:15 we spot a Broad wing Hawk. It is still overcast but warmer at 6:30pm. 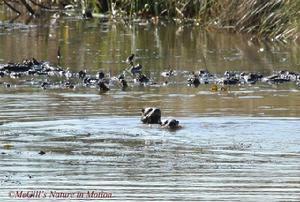 Busy little muskrats break the otherwise still surface of the Pools. Our E Pool eagle is guarding the nest as one of its young sits near the edge of the nest. The trumpeter swans are guarding their mates as they incubate on their nests throughout the Refuge. It is amazingly quiet!!?? We do have a fight between an eastern kingbird and a flicker. The osprey is on the nest on F Pool with its mate landing in a tree nearby. The J Pool loons are together, so nesting there yet. A beaver is out feeding. We stop to check out a beaver on the H/E marsh/channel area on the west end of the Fishing Loop. We have a couple of ospreys having a territorial dispute. I think F Pool osprey is in the tree and the D Pool osprey is encroaching on its space. 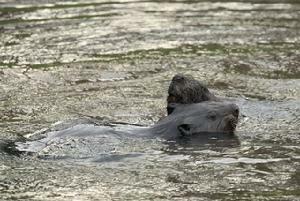 There is a huge beaver swimming near the E/D spillway. Three ring necks have been hanging in the same area. Looks like the one female has finally chosen which male she likes. Our D Pool osprey is still nesting. 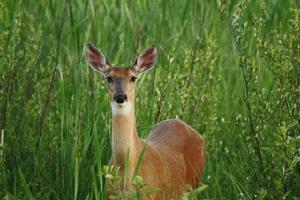 We spot a doe in the B marsh that looks like she is probably ready to have her young soon. Yeah, our C Pool loons are near the drive and pose for us for several minutes before heading further out. We were very lucky because the sun was breaking through the clouds for those few special minutes. The trumpeter swans were �rumbling� on C Pool chasing off the bachelors who were too close to the big dude�s nest. We end the ride with the music of the peepers and frogs. Sweet! <?xml:namespace prefix = o ns = "urn:schemas-microsoft-com:office:office" />Another overcast morning, we had thunderstorms in the middle of the night.We decided to stop in and see the girls at the Visitors Center. I got to meet Mark�s wife, Susan, who just retired from teaching on Friday. She is now volunteering at the Visitors Center. Our dear friend, Pat, was back at her post along with Ranger Sara and Jan. They had lots of visitors which is so nice to see. We always enjoy our conversations with everyone who shares our love of nature. There was a loon on F-1 behind the Visitors Center. They had seen up to three at a time. That�s not a good sign. 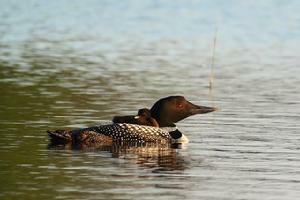 If the loons are getting social they are probably not going to nest. Time will tell.We headed into the Refuge around 11:00 with the sun trying to peek out through the clouds. We have a loon calling on E Pool where one of our eagles is soaring searching for food.F Pool has one loon visible and hopefully the other on a nest. This is ABJs territory so we are hopefully that he and his mate are nesting. There must have been a dragonfly hatch. They are everywhere.Our G Pool loons were at the east end of G then they took off and actually landed almost in front of us!! That was cool to see. They actually land on their bellies. Their feet are so far to the back of their bodies that would actually tip over if they tried landing on their feet. We have the G Pool eagle soaring around. He lands in a pine three on the island at the west end of E Pool. He doesn�t stay long but soars back toward G Pool.The D Pool loons are together but this isn�t bad�they are working on a nest!!!!!! That means they are hopefully re-clutching. They are not usually very successful the second time around, but we can hope!The C Pool loons are still together in the area we saw them last night. A pair of Sandhill cranes flew into the east end of B marsh. At the end of C Pool another loon lands to join still another loon. A broad-wing hawk is hunting in the marshy area toward the end of the drive which we ended at 12:30.We also spotted a loon on the north show pool about an hour later. But decided the gloom was here for the rest of the afternoon so we packed up and headed home. But we shall return!! <?xml:namespace prefix = o ns = "urn:schemas-microsoft-com:office:office" />We were late getting away so we didn�t get through the Refuge till 8:30. It is 70 degrees, clear and beautiful.We hear a bittern glunk, glunking in C marsh. The eagle family is together on and near the nest on E Pool.We two sandhill cranes in C marsh and two more further down. A doe is on an island in the middle of E Pool. We seem to have geesey, gooseies everywhere! !The loon on D Pool is not on the nest but nearby. We think the bugs are really bothering them. The D Pool osprey is on the nest.A pair of sandhill cranes are feeding in B marsh. 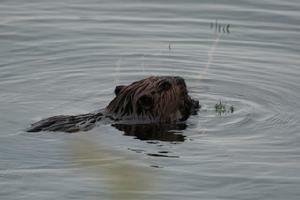 There are beavers and muskrats throughout the Refuge. C Pool has one loon midway and two toward the end of the pool where a merlin is after some little kingbirds. We head out as the sun is setting in the west. We spent the morning on the tracks of the Toonerville Trolley filming and photographing black bears and Sandhill cranes. 2:30 and we are heading into the Refuge. It is a gorgeous day!! It is 74 degrees without humidity! It looks like most of the trumpeter swans are still on the nest. There are forty or more Canada geese on F Pool having �island parties�. 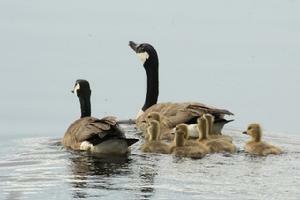 The geese with families don�t seem too pleased with all of the ruckus. The osprey is still on the nest on F Pool. Little birds are attacking the bigger birds no matter what they are. The trumpeter swans have invaded G Pool!! There must be fifty or sixty of them. And our loons are on a nest!!!! Yes, it is a very good day!! We could be looking at having babies by the end of June depending on just what day they actually laid the eggs. It was probably June 1st or 2nd. The trumpeter swans at the end of E Pool have five beautiful little cygnets. Hopefully, they can survive the hungry snappers, pike and eagles. Yes, our D Pool loons are on their nest they were building last weekend!! The day can�t get much better. The osprey is nesting quietly. Yes we have C Pool loons nesting in a different area then what they had originally!!! This is awesome!! Now hopefully, the nests will come to fruition. The E Pool eagle is hunting on B Pool. A HUGE snapper is on the drive at the east end of C Pool. Eastern kingbirds are playing around the small pool. We finish the run at 4:45pm. We head back to the trailer for a break. 6:40pm it is still 74 degrees and beautiful!! Geese, geese everywhere on F Pool. 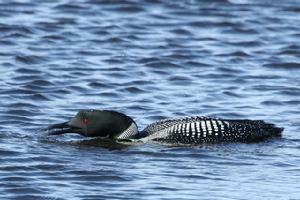 We have one loon low in the water on F Pool. Hopefully that means one is on the nest. The eagle family is together on E Pool. The osprey is on the nest on F Pool. We have two loons on J Pool. We aren�t sure if they are a couple or not but we think they may have a nest nearby. We will continue to monitor. 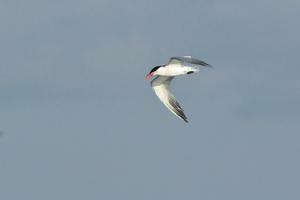 The terns are noisy as usual on their island on J Pool. We snipes calling but no sign of the little buggers. We have two eagles flying over G Pool. One goes down near an island where it must have stolen something from an osprey. The eagle took off followed closely by the osprey. They carried on for some time before the osprey finally gave up. Ring necks are paired up on several of the pools but not on nests yet. A loon is calling on E Pool but we don�t see it. It is a gorgeous evening with 72 degrees and clear. D Pool is on its nest. C Pool loon is on its nest. All is well in the world. A bittern is in B marsh but it was too far to get a pic. The osprey has something in its one talon but not sure what. It is taking back to the nest on M-77. We have two loons on the small pool at the end of C Pool. We film and photograph them as they posture and point their heads, a sign of being social. They talk to each other than one takes off leaving the other to swimming around for a while before it too takes off. We end the evening content and happy that all is well and good in the world (of nature). <?xml:namespace prefix = o ns = "urn:schemas-microsoft-com:office:office" />It is a partly cloudy morning with rain earlier in the morning. It is 60 degree at 9:15.We were surprised to find F Pool loons with a new chick!! For some reason we never knew that they had a nest quite so visible. Those islands have usually been covered with Canada gesse. They must have been on the nest since May 9 or so. 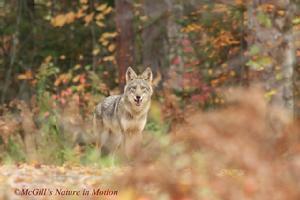 It is a happy day at Seney National Wildlife Refuge!! 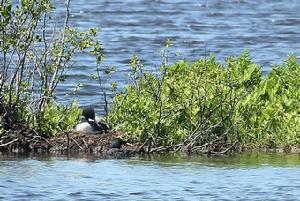 The first loon of the summer is born, of course, to the oldest know loon, ABJ, who was born right here on the Refuge! !We have a great blue flying over F Pool on its way to C Pool. It is the first one we have seen in over three weeks.The ospreys are on and near the nest on F Pool. They must have young now because the adult is on the edge of the nest as opposed to in the nest. A snipe flew out of a tree on H Pool calling as it flew. 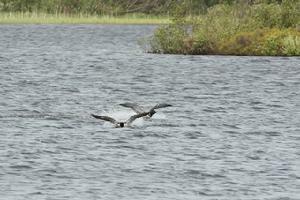 An adult eagle is flying low over H Pool which caused a loon give a warning call. The loon is on the backside of H Pool. We are hoping that there might be another loon on a nest back there.There is a pair of snipes fluttering and calling in the F marsh. The J Pool loons are together near the area we think that they may have a nest. We will keep an eye on that.The G Pool trumpeter swans are off their nest but do not have any cygnets. The loons are off their nest but nearby. We are hoping one of them was going to get back on the nest. We just drove by hoping for the best. We do want to emphasis that the most important thing is to not cause stress to the loons. If they are both off the nest don�t wait to watch it get back up on nest. Some loons will not get on the nest if someone is watching. To them if you don�t see them get on the nest then you don�t know it�s there. If they are on the nest don�t stay too long they may get upset and leave the nest.The G Pool eagle soars over G Pool then over E Pool where a loon gave a warning call. The loon was back near the trumpeter swans nest. The trumpeter swans were there with their five cygnets. Our D Pool loons are still on their nest. It was calling its mate who was preening further down the pool. It didn�t seem too worried about hurrying back to its mate. Our osprey is still on the nest with its mate keeping close tabs on it.C Pool is still on its nest. Its mate was further down the pool, too. So we head home with happy hearts that the loons of summer are back amongst us and successfully starting the next generation of Seney loons. We needed to make a donut run for the black bears of the Toonerville Trolley, so we decide to take a jog over to our favorite place, Seney National Wildlife Refuge. We hoped to surprise Pat at the Visitors� Center. She didn�t think we were going to be up this Monday. It is a gorgeous morning!! At 9:00am it is 60 degrees, sunny with a slight breeze. There is a pair of ring necked ducks on the North Show Pool. On the South Show Pool there is a Canada goose family and a trumpeter swan family with five cygnets. F Pool is loaded with geese, singles and families. The trumpeter swan pair here also has five cygnets. We have a Wilson Snipe calling. 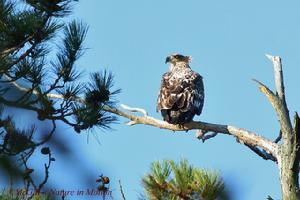 We can hear the crying of the osprey�s offspring on F-1 Pool behind the Visitors� Center. 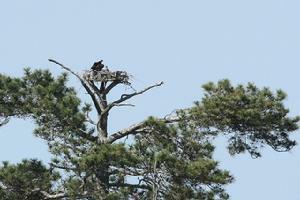 E Pool eaglet is on the edge of the nest while one of the parents looks on from the tall pine. The F Pool osprey is on the nest watching over its resting young. 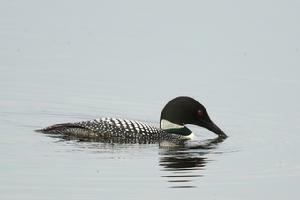 H Pool has a single loon feeding near the drive. Lucky for us it stayed long enough to capture some photos. On the other side in F marsh a Wilson Snipe flew into the reeds where a Canada goose family of six where feeding. The common tern colony on J Pool is very active this morning. 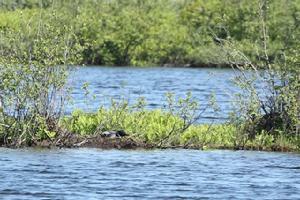 We spot the J Pool loon on its nest not far from the terns� island. Across the drive an American Bittern flew into the tall reeds as a Wilson Snipe calls. 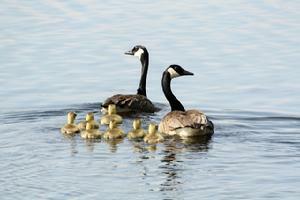 J channel has one Canada goose family w/ two goslings and another family of six. Well the trumpeter swans still are on G Pool en masse. There are at least seventy of them feeding ravenously. The loon is still on the nest!!!! Its mate is nearby keeping a watchful eye. The trumpeter swans have five cygnets on the west end of E Pool where the G Pool eagle is hunting from the perching tree. Yikes! They had better beware! A pair of Sandhills is flying over D Pool where sadly our loons have abandoned yet a second nestL. Our osprey is still incubating its eggs. We have a pair of Sandhills in C marsh, hopefully, they may have a young. Time will tell. Further down on C Pool our loon is still on this nest!! Yeah! That makes at least three nest still viable; possibly more. 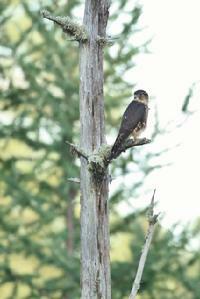 A male merlin is hunting in the trees in B marsh. A pair of ring necked ducks is in the cove on C Pool. Around the corner is a pair of trumpeter swans with six cygnets. 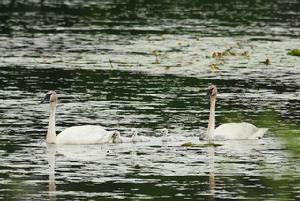 Then at the end of C Pool is a pair of trumpeter swans with four cygnets. We end the run at 11:30am. We stopped in at the Visitors� Center to see the girls. Sue, Pat and Claudia were all working along with two new interns. We also paged Sara to come over to show her some info. After a nice visit we decided to take Pat on a run through the Refuge to show her where all the loons are nesting at. And to show her where all the trumpeter swans are-on G Pool! 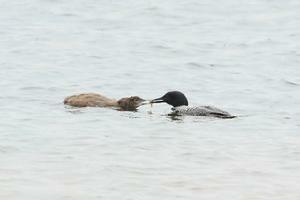 No sign of ABJ, Seney�s oldest loon, and his week old chick who reside on F Pool. Our F Pool osprey is feeding at least two young chicks. The loon is still on the nest on J Pool so Pat got to see that one. G Pool is still full of trumpeter swans but instead of feeding ravenously they are raising a ruckus, chasing each other. Our loon is on the nest but acting nervous. I actually think it is ready for its mate to take over nest tending duties. It is swimming low in the water nearby acting like it is waiting for us to move on before changing guard. The D Pool loons are together peering and swimming around. The osprey is still laying low in the nest incubating the eggs. C Pool is still diligently tending its nest while further down we have three loons socializing and trumpeter swans fighting. There is quite a lot of activity for being in the heat of the day. We finish our trip through around 2:30. We take Pat back to the Visitors� Center. It was so nice she was able to come with us. We had wanted to do that for some time. Well, there is no time like the present and the weather was perfect. Next time it�s a quick ride on �the chair�J! Michael and I decide we need to make one quick trip around the Marshland Drive to check out what is happening there. Yeah! We finally have a Great Blue Heron on F Pool. 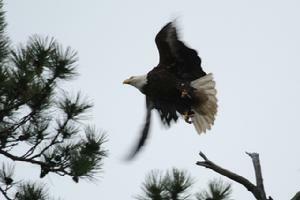 He flew over to one of the island when a grandpa and his young teenage granddaughter stopped to check out the action. It is so nice to see grandparents sharing with the younger generation. We need to instill this love of nature at a young age. Our great niece, Noel, wants to get her camera and come up with Uncle Mike and Aunt Teresa to photograph eagles, loons and anything she can see. Sweet!! She is only six years old!! The E Pool eagle is still standing guard over its growing eaglet. We have a lone loon at the west end of E Pool. It was acting nervous and swimming very low in the water. Maybe there is a nest nearby on the backside of one of the islands? Time will tell. 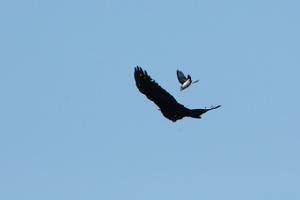 We have a raven being attacked by an Eastern Kingbird. No nest robbing for that raven, hopefully. We have a pair of Sandhills in a grove of trees on B marsh. The one appears to be dusting itself in the dirt. It is lying down. We thought they might have a young but when it finally got up�.nothing. The three loons are still in the area. Our trumpeter swans with four cygnets are at the end of C Pool. So we stop to shoot some photos of the wee ones. While we were watching them an osprey flew over with a fish. It acted lost and was crying. We think it might be the M-77 ones that lost their young. It is amazing how the creatures mourn for their loss just like people. We have seen it time and again. We headed into the Refuge around 4:00pm with the temperatures around 80 degrees. There was still quite a crowd at the pavilion picnicking after the Kids Fishing Days activities. The pair of ring necks is still in the pool in front of the Visitors� Center and on F Pool. ABJ and his mate were within view finally. And they have two chicks! They eventually made their way over to the Fishing Loop side of F Pool where Michael and I were finally able to get some photos. The F Pool osprey was feeding her chicks. The H Pool loons were out and about. We are hoping the one was just taking a break off the nest. We will find out possibly tomorrow. G Pool loon is still on its nest!!! Yeah!!! The trumpeter swans are still seventy plus strong on G Pool. The ring neck couple is still on the west end of E Pool. 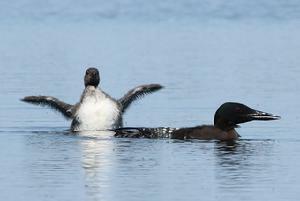 The two D Pool loon are just enjoying their freedom from not having young this summer�again. The D Pool osprey looks like it is feeding a chick. We will have to check it out tomorrow. C Pool loon is still on its nest, too!!! Hopefully we will have young in the next week or two. The mate is just around the corner zipping and preening its feathers. Further down the trumpeter swans have three cygnets with a loon in the same area. Our trumpeter swans still have their four cygnets which is good after a whole week. We decide to take another quick run through to check on E Pool loons. 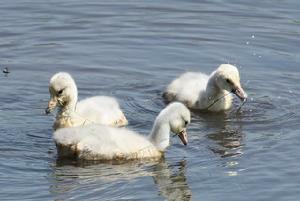 The F Pool trumpeter swans still have their five cygnets. The ring necks are everywhere. But where are the pied bill grebes? The kingfishers? The great blues? The bittern? There are two loons on the east end of E Pool. No babies there, in fact, another loon flew in to visit them. The eagle family is all together in the trees. The eaglets are sitting on the edge of the nest. One parent is in the tall pine the other is halfway up another pine. Cool! The west end loons are together, too. But we hope one is just taking a break from nest sitting. We check them out, too. Painted turtles, Canada geese and goslings are everywhere. The D Pool loons are near the shore taking a break. We had quite a show over B marsh. A pair of Northern Harriers were hunting or at least trying to hunt. Red-winged blackbirds were attacking them! The female disappeared into the woods. The male put on some major acrobatics for us!! Michael was able to capture some of it on film and I got a few descent shots off. Further down an American bittern flew over us. Yeah! I had just complained about not seeing any. The C Pool loon is still on the nest and around the corner is its mate. All of a sudden it started calling. We looked up and here came a second year eagle! It acted like it was going to come down after the loon. It veered and snatched a fish out of the water. It flew back over the loon then headed to the east. 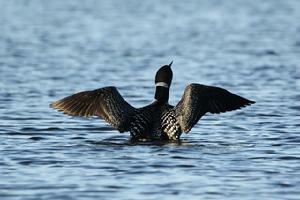 In the meantime the loon bolted out of the water several times to show its anger. It was totally awesome. And Michael got most of it on film!! 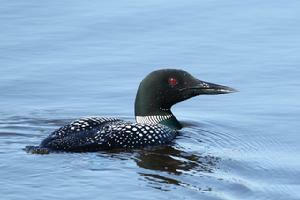 Around the next corner a solitary loon posed for a few shots for me. Around the next corner were two more loons. Our trumpeter swans and four cygnets were feeding in the cove at the end of C Pool. They came closer and closer so I got out to shoot them despite the waning light. While I was shooting them two little beavers were playing in the corner. I shot them circling and hugging and �kissing�. It was so sweet!! They didn�t even care that I was there. What a great way to start the weekend. And what a great way to end a long week. <?xml:namespace prefix = o ns = "urn:schemas-microsoft-com:office:office" />We didn�t make it into the Refuge yesterday. I spent the morning catching up on updating website etc. I also called and wished my dad a �Happy Father�s Day�. We had made arrangements to be at the Toonerville Trolley. We needed to replace our �bear� blind cover which was shredded in an earlier hail storm. We only saw some Sandhill cranes and a few turkey vultures, oh, and one small hawk, but not sign of bears. Dixie things the boars are chasing the sows around right now.Dixie and Kris have two fawns right now back by their cabin. They expect to have more before too long. They are so used to Kris and Dixie that the mother�s actually bring them around to off their fawns. Sweet! I hope to get back and photograph them before they get too big.We then meet a local couple who have two charming teenagers who are both interested in photography. The boy was the one who actually approached us about what we do and asked for our website info. After a long nice visit, we told him we would get in touch with him to take him on the �chair� through the Refuge one day. He thought that would be awesome. We woke up this morning to another overcast day. We were going to go film black bear on the tracks of the Toonerville Trolley but decide to hang out at the Refuge instead since we didn�t go yesterday.10:00 it is 63 degrees with an easterly wind. The kingbirds are flying and fighting. The F Pool loon family is near the beginning of the Marshland Drive. 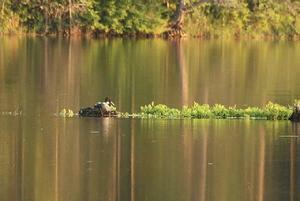 The babies are being fed by one parent as the other stands guard warily watching a turtle in the area. The trumpeter swans with cygnets are nearby, too. So hopefully, they are watching out for their young, too. The E Pool eagle is watching over its two eaglets. One eaglet is on the edge of the nest and the other is lying down. The Canada geese without families seem to be gathered on the north side of E Pool.The F Pool osprey is feeding its chicks. Common terns are fishing and muskrats are gathering sweet grass. The other osprey is fishing over H Pool. 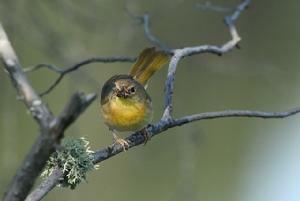 It is a full time job feeding their young.Common yellowthroats are busying catching bugs and chirping witchity, witchity, witchity. Cedar waxwings are gathering berries and sharing with each other. 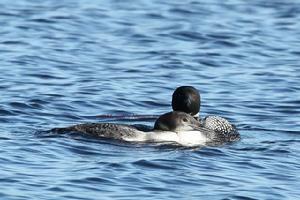 Sweet!The two loons are together on H Pool so most likely no babies again this year for them. Snipes are calling and flying around H/F marshes. 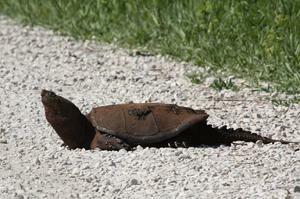 A big snapping turtle is along the drive near J Pool where are loon is definitely still on the nest! Yeah! !We interrupt morning naps for two Canada geese families. Everyone is up and back in the water on J channel where we spot a male Northern Harrier hunting.We spot two does in H marsh but no babies. 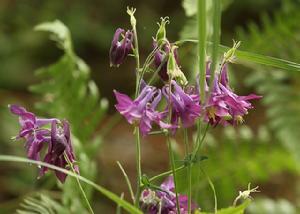 There are gorgeous wild columbines growing near the G/J Spillway.Our G Pool loon is also still on the nest! It lets out a distress call when it spots the G Pool eagle fishing overhead. There are still 70 plus trumpeter swans calling G Pool home. The G Pool eagle flew over to E Pool spooking up some wood ducks we think it had its eye on. It then landed in a pine tree on the island on the west end of E Pool.D Pool has one lone loon that we can see. After two failed nests I guess they decided to call it quits. The ospreys are both in a tree near the nest, enjoying this rare time they can spend together.Our C Pool loon is still diligently manning its nest. 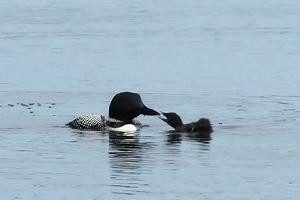 Hopefully, next weekend we start to have a few more baby loons on the Refuge! The C Pool loon�s mate is further down to the east.We have another loon near the end of C Pool where we have been seeing up to three of them. It must be a good fishing spot. Our trumpeter swans at the end of C Pool still have all four cygnets! Yeah!! As we are watching them a pair of Sandhills fly and land on the outcropping at the end of C Pool. Common terns are fishing on the small pool. We spot a wood duck and flickers but otherwise it is very quiet on the last part of our drive. There is a loon out on the south show pool! We entered the Refuge at 8:15pm. It is 73 degrees and partly cloudy. The F Pool loons and their two chicks greet us. The E Pool eaglets are still in their nest with one of their parents as sentinel. 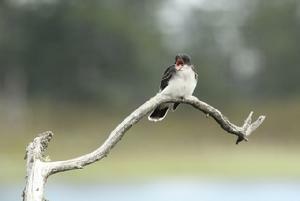 Eastern kingbirds, flickers, red-winged blackbirds and muskrats are everywhere. There is an American bittern flying over the F/E spillway. The single geese are gathered on the north side of E Pool. F Pool osprey is tending its chicks. The H Pool has one loon visible. The trumpeter swans still have five cygnets. 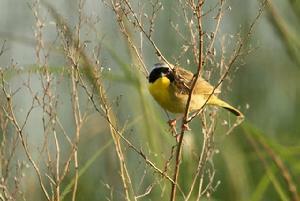 The common yellowthroats are busy catching bugs. A pair of sandhills is in the H marsh as another flies over J Pool. The G Pool loon is still on its nest with its mate out farther in the pool. Snipe just flew by the nest. We spooked up a ruffed grouse along the side of the drive. The trumpeter swans are still hanging out on the end of G Pool. The west end of E Pool has a few male wood ducks on it. The D Pool loons are on yet another nest!!! This makes their third attempt this season. We can see two eggs in so� hopefully. The osprey is in B marsh keeping an eye on its nest from a distance? C Pool loon is still on its nest. There is a pair of ring necks further down. Two doe are in B marsh and another one further down. Our trumpeter swans at the end of C Pool have three cygnets. They must have lost one. 7:00am it is gob smack gorgeous! Sandhill cranes are out by the south show pool. 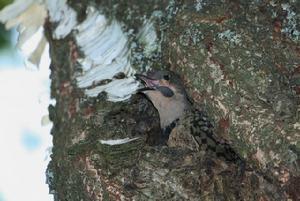 As we stop for Michael to get in his �chair� we find a family of flickers in a nest in one of the trees. Sweet! Trumpeter swans have most of their cygnets yet, no thanks to snapping turtles, pike and, dare I say it, eagles. The osprey from F Pool is fishing overhead the other is in the tree near the nest. The eastern kingbirds are feeding on bugs. We have a trumpeter swan with three tiny cygnets in the marsh on F Pool via the Fishing Loop. As we are photographing the cygnets a Wilson Snipe is zigzagging across the sky overhead chattering as it goes. 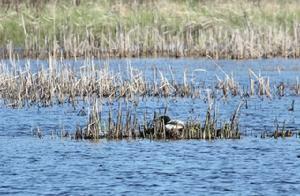 The loon is still on its nest on J Pool with its mate not far away. 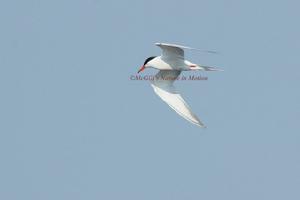 The common terns are squawking on their �island�. Two does are in the marsh along the J/G drive. Further down the road we spot our first sharp-tailed grouse of the season. The G Pool loon is quietly sitting on its nest while its mate is entertaining a visiting loon. We stop to watch knowing that sooner or later the visitor will fly off. While we were waiting, we were entertained by an osprey attacking the G Pool bald eagle that was fishing from a pine tree at the back of the Pool. The visitor finally flies off and, luck for us, flew right by us!! It flew off over E Pool where it riled up the E Pool loons. Before we knew it we had three loons flying over G Pool. Sweet! As we make our way down the Pool, the G Pool eagle flies over upsetting the loons and is hassled again by the D Pool osprey. Awesome aerials! The D Pool loon is on the nest and its mate near the drive doing a little fishing. Finally kingfishers on the backside of D Pool! 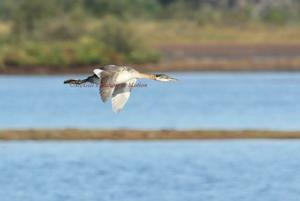 As we travel down along C Pool we have a snipe fly over and two sandhills in B marsh. Yeah!! A little pied bill grebe is on C Pool. We get to photograph it before it moves further down the pool. The C Pool loon is still patiently sitting on its nest and its mate is further down near the C/B spillway. We have ring necks and wood ducks further down. On the end of C Pool we have a pair of loons. Our trumpeter swans are there with their three cygnets. Along the way we met Ken Warning, a fellow photographer from Wisconsin, who has been following my journals. He hopes my prediction of hatching loons possibly by Tuesday comes true. Me, too. <?xml:namespace prefix = o ns = "urn:schemas-microsoft-com:office:office" />11:00 run through F Pool loons are close to the shore for some good photo ops. 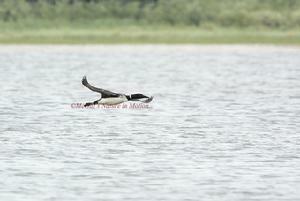 While we are photographing them the E Pool eagle flies over causing the loons to become agitated. 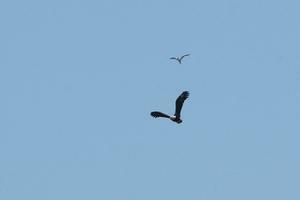 The eagle had a little common tern attacking as it flew over. 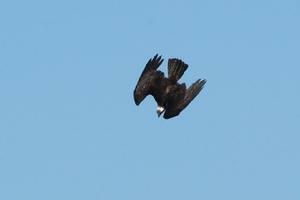 The E Pool eaglets aren�t being too active. There is always one parent keeping an eye on them at all times. We can�t wait for the young to fledge. They usually spend a little time in the trees along the Marshland Drive which makes for great photo ops!As we travel down the Fishing Loop we discover three little ravens sitting in a tree. They must have just fledged recently because they were not too graceful. I have wanted to get some more photos of ravens for my children�s book. These will be perfect! I never knew that young ravens have blue eyes!! Sweet! !We film the single parent trumpeter swan and her three cygnets again. The H Pool loons are swimming together toward the back of the Pool. It is pretty much status quo with our nesting loons. We stop to check out the osprey nest. We wait for over an hour to see if we can catch a glimpse of the chicks but no such luck. As I am hiking out I see the one parent fly out of the trees behind the nest area. It lands into the dead trees on B marsh where we had seen it before. We figure the parents wait for the young to wake up and get hungry then tend to them.While we were waiting we found kingfishers, common terns, pine warblers and the eagle flew over a couple of times. So it wasn�t without some excitement.We end at 4:00 to head back to the trailer for �lunch� break and for me to go through photos. Seney Journal June 26, 2011 6:30pmWe head back into the Refuge at 6:30pm. As we head down the drive an American bittern flies over, a great blue heron is in F Pool then flies over and a snipe lands nearby� but no shots! Nothing out of the ordinary is happening. We miss out on a few more shots of flying bittern. At the end of C Pool the pair of loons is not happy with something. We find an osprey attacking an eagle who is �fishing� from a tree on the out cropping where our trumpeter swan family stays near. I wanted to go and scream at the eagle but Michael thought that would be fruitless and a little crazy. We made an early run through before the clouds over took the sky at 7:00am. A loon was on the South Show Pool where a bittern also flew on the backside of. Kingfishers are finally being more visible!! Could see F Pool loons but we heard them yodeling. There must have been other loons or an eagle flying over them. The E Pool eaglets are up and ready for breakfast. The osprey is overseeing its nest on F Pool. The H Pool trumpeter swans still have their five cygnets. Common terns are fishing over H & J Pool. A pair of ring necks is feeding on the J channel. A male Northern Harrier just headed north on a morning food run. 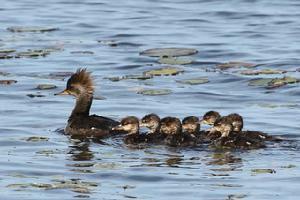 The momma hooded merganser still has five or six of her young with her at the back of J marsh. The G Pool loon is on its nest as its mate patrols the perimeter of the pool warding off all intruders. We decide to observe them for a while to see if there is any chance of young in the near future. 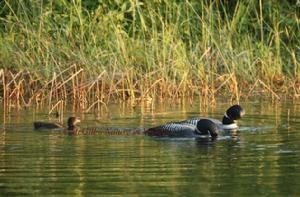 Two loons flew over causing the nesting loon to go into the defensive position. A pair of trumpeter swans came to the edge of the nesting island to preen. We finally moved on to see what else might be happening down the drive. An American bittern flew into the tall grasses just passed the D/E spillway on the D Pool side. Oh, my gosh, the darned D Pool loons are off their nest�again! Two other loons are on the backside of D Pool so the pair decides to go socialize! Whatever!! Doubtful we see anything positive come out of that. The C Pool loon is diligently man the nest as its mate is feeding further down the pool. We also have loons flying over B marsh. Further down C Pool we have a pair of trumpeter swan with two cygnets. We didn�t catch a glimpse of our pair to know if the eagle got any of our three little ones. There were some wood ducks bobbing around the cove on the end of C Pool. By the time we ended the run the wind had really picked up and so had my headache. I think yesterday finally caught up with me. I had too much sun, photography and journaling from 6:30am to 11:30pm. So a quick nap might be in order before we head over to Vermillion Pt. where the old Life Saving Station use to be between Whitefish Pt. and Crisp Pt. It is now under the protection of the Little Traverse Land Conservancy. Great trip to Vermillion saw a young red shouldered hawk, two tiny baby sandhill cranes, two young fledged merlins, a fawn and a baby bunny. Fun!!! Well, it�s our last day and it is rainy, cold &windy so we chill out, catch up on some rest and Facebook time J. We head into the Refuge around 1:00. It is 52 degrees with a wind chill in the 30�s L.
Needless to say, everything is laying low trying to stay out of the wind. Our E Pool eagles and our fledged ravens are hunkered down. The loon on J Pool is on its nest with its mate further out in the pool. A trumpeter swan is flying into the pool which the dominant male is not happy about. The common terns are squawking and carrying on raising a commotion on their island. Two sharp-tailed grouse flew out of the drive on J Pool side. The pair of ring necked ducks are bobbing up and down on J channel. A kingfisher speeds across the J/G drive in front of us. Further down another sharp-tailed grouse flew out of the J/G marsh. D Pool osprey is fishing over G Pool buffeting against the wind. Our loon is still on its nest waiting patiently for the arrival of its offspring. It should happen any day now after we are gone, of course. The trumpeter swans have all gone to the backside of G Pool to stay out of the wind. Another kingfisher bolts in front of us on the west end of E Pool. It is nice to be finally seeing them again. We had been worried about their absence from the Refuge. The G Pool eagle is soaring over the west end of E Pool where it finally lands into the feeding tree. D Pool loon is back on its nest�again. Its mate is nearby probably waiting for another chance to party with the boys. C Pool loon is still diligently sitting on its nest with its mate, also nearby. 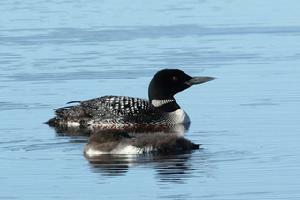 Both G Pool and C Pool loons should hatch their young around the same time according to my calculations. Actually, Saturday might be a closer guess to the date then 4th of July. We may try to make a quick run up on Saturday. Unfortunately, I have to man the shop on Sunday and Monday giving my gal the holiday off to be with her young family. Some things are more important than our loons hatching. We will see the babies when we get back up on Saturday, July 9. There is a lone loon further down on C Pool. Our east end trumpeter swans are in the cove protected from the weather. Unfortunately, they only have two cygnets now. That darned bald eagle must have gotten one Sunday night. Oh well, it is nature-survival of the fittest-and all that stuff. L ! Hope to report the arrival of more loon chicks when we get back up, actually, Friday night July 8. We needed to make a donut run for the Black Bears of the Toonerville Trolley. We got to Soo Junction around 9:00am.We had a quick visit with Dixie and Michelle. They were really busy with customers taking the Tahquamenon Falls Riverboat Ride on this gorgeous day. We headed into the Refuge around 10:45am. It is 75 degrees and getting clearer by the minute. Our eagles on E Pool are still sitting on the edge of the nest as one parent continues to watch over them. A ring necked duck is flying as the good ole boy club of Canada Geese gather on F Pool vial the Fishing Loop. We have two osprey chicks in the nest on F Pool who start to chattering when they see one of their parents bring them a snack. Sadly our single parent trumpeter swan is now cygnet-less. The trumpeter swans last young lies dead at the side of the drive. She is mourning it, telling us of her sorrow. It is so sad. Glad I got the pictures that I did of the little tykes. H Pool trumpeter swans still have four cygnets left. The eastern kingbirds and red-winged blackbirds are chattering and flying every which way. J Pool loon was off of its nest but as we approached it got back on and turned its eggs. So they are not ready yet but soon. As we approach G Pool we can see that our loon is still on the nest. We decide to watch them for a while. The mate is nearby which is unusual for this one. If it is almost time for the eggs to hatch the mate will remain in the area. As we are watching the nesting loon starts to fidget and squirm. We are sure that the hatching has begun! It isn�t too much longer when it slides off the nest with a quick �laugh� call. Viola! There is the little chick fresh out of its shell. The loon that was nesting is very attentive; watching to make sure everything is fine. The other loon comes over, looks at the new chick then swims off. No hallelujah chorus there L. The unveiling took place around 11:20am. The good parent gets back on the nest. It settles the chick under it along with the egg that needs to be incubated. We decide to continue our run to check on C Pool loons. We shall return. D Pool surprisingly is still on its third nest. We don�t see any signs of our D Pool ospreys. We have a merliin chasing a kingfisher which is trying to feed its young, oh my. Sandhill cranes are in B marsh but no chick. C Pool is still on its nest but positioned in an odd manner. Its mate is further down on C Pool so probably not hatching today. 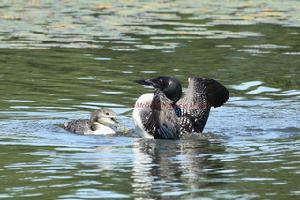 Our second quick run through we found G Pool loons trying to persuade the first chick off the nest and into the water. But it wasn�t having any of that. It was still only a couple of hours old. We are sure before the day it out in will probably be in the water and on the parent�s back. But unfortunately we can�t wait around for that to happen. I have to work the next six days in a row. And after two short nights of sleep, I am feeling a little sleep deprived, not good. 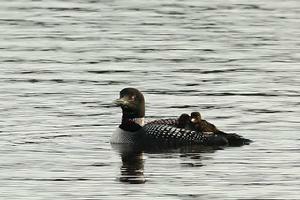 When get back on Friday night we know we will have, hopefully, several loon chicks to be photographing and filming. Till then, adieu. We headed into the Refuge around 8:30pm. It is a gorgeous night, clear sky and 70 degrees. F Pool loon, ABJ is at the start of the Pool with his two chicks. Mrs. ABJ is further out fishing. One chick looks to be a week older than the other one. Interesting. There are four Sandhill cranes on an island in E Pool. The young eaglets are out of the nest but still in their safety tree. They should be fledging soon. F Pool osprey is feeding its two big chicks. The other adult is flying over with a fish but takes it to a tree to eat. J Pool loons have at least one chick that we can see. They are out too far for us to really be able to tell. Yeah!! G Pool loons are near the shore. The one is eating a big fish and the other is tending the chick. We are able to film and photograph the parent and chick as the sun is setting! The chick even got on its parent�s back a couple of times. Sweet!! D Pool loon is still on its third nest. The osprey looks like it was just feeding its chick? We have to verify that tomorrow. The C Pool loon is still on its nest. Interesting. I thought it should have had chicks already. Although, they can hatch another egg a few days later. We will verify that tomorrow, too, hopefully. We have a loon flying over the east end of C Pool where an osprey is fishing. We end the evening happy to be back and thankful for the photo ops we were given by our loons on G Pool!! We spent the first part of the day on the tracks of the Toonerville Trolley. 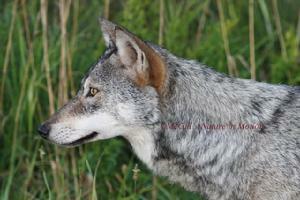 We did spot Ole, Goofette�s yearling cub. 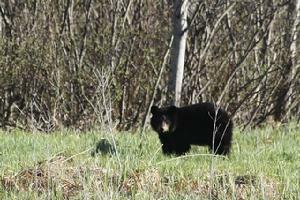 The crew also finally saw Beulah and with her one tiny cub!! Finally we have a baby on the tracks. Hopefully, we will get some shots of them soon. We headed into the Refuge at 4:30. It is 77 degrees and hazy. There is a single loon on the South Show Pool along with a pair of trumpeter swans. A male wood duck is in the pool in front of the Visitors Center. The F Pool loons are out and about. I watched ABJ as he was corralling his young. They were in a channel along the Fishing Loop. He went into a small opening on an island got on LAND turned around then came back out. Strange!! 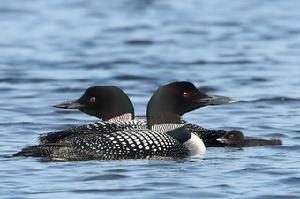 Loons normally only go on land to copulate and nest. I�m not sure just what he was supposed to be doing. Interesting!! Muskrats are out everywhere. We have a Northern Harrier soaring over H Marsh. J Pool loons with their one chick are out too far again. Yeah, our G Pool loons are together. We get a few family shots but it is too hazy to be crisp. We make another quick run through to see if we can get some shots of G Pool loons between some of the cracks in the clouds. As we set watching them the male lets out a wail. 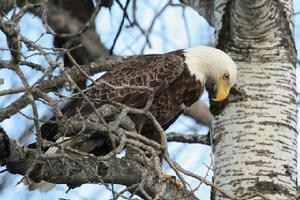 We discover G Pool eagle is �fishing� just down from the loons. When we get closer the eagle takes off flying over to E Pool raising a ruckus. Actually I think we saved the life of a ring-necked chick or two, which we discovered were right under the tree the eagle was �fishing� in. 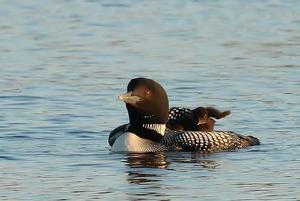 As I sat and filmed the one loon with its chick on its back, it seemed to feel safe with me. It came closer and closer till finally the other came over and they headed out for the night. We head back hoping for a slim chance of nice weather tomorrow. It is a gorgeous morning with temperatures at 71 degrees at 8:00am. We stop at the Wigwams to put the chair on. Michael took it off last night in case it rained which it did. The snipes were calling and flying around. All the little songbirds were happy with the day. The eaglets are still sleeping. The muskrats are all busy gathering sweet grass for their families and the ospreys are taking care of their young. J Pool loons are out with their one chick as the common terns swoop and dive all around them. The smell of milkweeds flowering in the air blended with the scent of pine trees is a soothing aromatherapy for the soul. Once again our G Pool loon and its chick are near the shore. We spent over an hour enjoying the family. The dynamics are very interesting to observe. The male seemed to be anxious with us but the female gave the sense of feeling very secure with us. Even though nature is as they say every changing, always �in Motion� it is to me always there to soothe the tired soul. It is something I can depend on to right the senses, ease the stress and revitalize my weary body. The trumpeter swans are still congregated on G Pool vigorously eating the vegetation. The kingfishers are back and raising a ruckus. The D Pool loon is still on the nest. Wood ducks are gathering on C Pool along with a couple of ring necked ducks with their wild chicks. C Pool loon is still on its nest but it has been on this nest since before June 6th. We don�t feel it is likely to make it. She is beyond the normal 28-32 days. Unfortunately, some creatures can�t quite give up when the nest fails. Last year H Pool loon sat for a week or two after it had failed. Its mate is further down on the pool not quite sure what it should be doing. Our trumpeter swans at the end of C Pool still have one cygnet. That is better than last year at this time; they lost their young before they were two weeks old. There was also a lone loon on the small pool. It is still nice so we decide to make another quick run through before the humidity fills the sky. You can see it moving in. 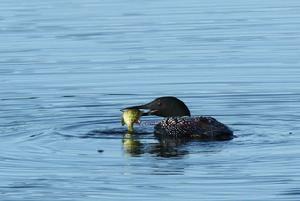 F Pool loons are feeding their two chicks. One is considerably larger than the other now I know why. The one adult was coming toward the littlest chick to give it a fish when Big Bubba swam right past and nabbed it! Maybe Big Bully would be a better name? We hear eagles carrying on. We thought it was the young ones wanting to be feed but it was actually the adults. The mother was down on a stump in E Pool, the father was up in a pine tree and the cause of the problem, a second year eagle soaring over them and their nest. The mother eagle was holding out her wings like a vulture does to dry them. I think see was trying to intimidate the younger eagle. The father would take off out of the tree after it but not really do anything to it. I think they were just trying to use scare tactics to frighten off which eventually they accomplished. At one point the male came down on the beach of the island? Not sure what for, he sat there for a little while then took off. The other interesting bit of information is that the female eagle is a new one. This female is only five or six years old with black still on her white head. This can only mean something happened to our �old� female. Eagles do mate for life even if there is proof that they may �mate� with another in the same season. Researchers have found that approximately 19% of eaglets have different DNA then their siblings. That�s what we love about nature, you never know what you might get to experience, things that not everyone is privileged to share if you�re not out there. We just say a quick �hi� to our G Pool loons. We meet a nice gal from New Jersey who is recording bird sounds. 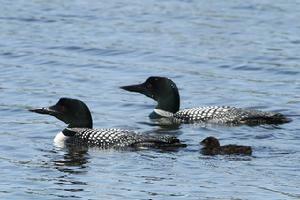 We pointed the loons out to her and explained that they have been wailing and using the tremlo call when eagles or other loons approach the pool. The D Pool loons are off the nest entertaining a visitor. We are not sure their third attempt at a nest is going to be successful either. They tend to like to socialize a lot. 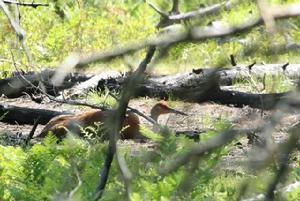 We saw a couple of Sandhills on a knoll in B marsh just enjoying the refreshing breeze in the shade. The humidity is building and I am starting to wilt so we decide to call it quits for now. We take a break and head over to Munising for pizza and Dairy Queen; the perfect combination on a hot summer�s day. We woke up to rain so we didn�t get around and on to the Refuge till 10:00. We figured we might as well stop and visit with everyone first in hopes of it clearing up later. A great blue heron was in the pool in front of the Visitors Center. Sara was heading to the office but came back in to talk with Michael about some much needed information. It is always nice to visit with our Pat. Sue was helping Claudia restock selves from the past busy week. Jan was talking to everyone. Quite a few visitors were in the Visitors Center. 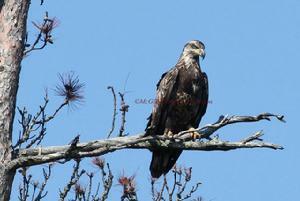 As we entered the Fishing Loop we spot one of the E Pool eaglets off their nest tree. Yeah! They have officially fledged. That means we may start see them in the trees along the Marshland Drive. The heady scent of milkweed flowers fills air with intoxication. The Snipes are calling all around us. 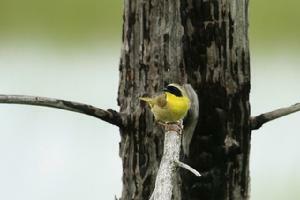 The common yellow throated warblers are singing up a storm. Fledged Flickers are dashing after each other. And the clouds are starting to clear out!! The J Pool loon with the chick was on the east end of the Pool near the drive that takes you back to I Pool. Its mate was out fishing in the middle of the Pool. The common terns were quiet for a change. One of the G Pool loons was near the curve. Before we got to it, it bolted out of the water, chasing off a wood duck! Very interesting antics! The mate with the chick was down the drive farther. We stopped to watch them for quite a while. A gentleman from Kentucky was there, too. 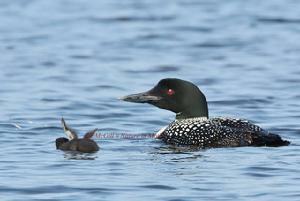 He had never seen the Common Loon chicks before and was quite fascinated with them. Of course, Michael chitchatted with him while I continued to photograph the baby. After all, this will be one of the last times I will be able to shot this young of a chick until probably next summer, Lord willing. So I want to make the most of the time I have. We finally mosey on as the heat and humidity build. The D Pool loons are off their nest taking a break from the heat. One of them does make their way back over to laboriously climb back up on the nest. As we approach the C Pool loon nest, the loon is off the nest calling for its mate, �where are you�. The mate doesn�t answer. The loon heads to the east end of C Pool but doesn�t go very far before it decides to go back to the nest area. Sad to see this poor loon, it just doesn�t want to give up the fact that its eggs aren�t going to hatch. They have been nesting over five weeks now which normal they hatch in four weeks. As we continue down the pool we spot the mate out in the water. It was there but just didn�t want to continue to incubate a failed nest. Animal nature is so like human nature. Well, the weather is definitely strange today. 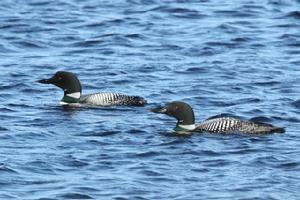 We still have a lot of blue sky out there so we decide to take one last quick trip around to check on G Pool loons. 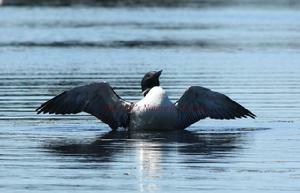 Like I have said this will be the last chance to shoot baby loons on their parents� backs till next summer. I know D Pool is still nesting but chances are slim to none that the eggs will hatch or the chicks survive. I didn�t note it before but the Canada geese seem to be everywhere!! F Pool loons are further down the Fishing Loop behind an island resting. The osprey chicks are up begging. We find our G Pool loons in the same area that we left them. 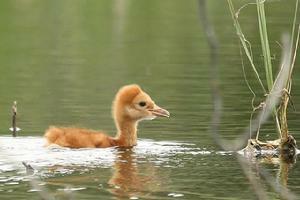 The chick is still in the water close to the parent. 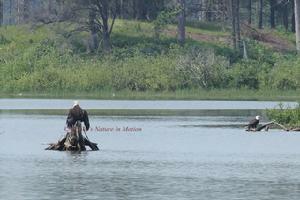 While we are filming them the G Pool eagle decides to do some �fishing� which of course upsets the loons. Eventually, the eagle went on the back side of the Pool away from the loons. The baby eventually, got on the back of its parent. Yeah!! It is starting to get too big for the ride. It eventually squirmed is way off its parent�s back and back into the water. The other parent has now made its way over to its family. It must be feed the baby time. It was so comically to watch the parents. It was like they were in competition with each other to see who could feed the chick the most or which parent it liked the best. Well, we bid goodbye to our loon family and head out of the Refuge. On C Pool we stop to check on the loon who is near the nest but at least not on the nest anymore, we hope. While we were sitting there a pied billed grebe pops up in front of us!! I get out of the car to snap a few pics so Michael can pull a head to let people by. By the time he comes back with his camera we have three chicks popping their heads up among the lily pads!! What a cool way to end our weekend!! We had only seen the grebe one other time, so it must have been very elusive while it nested. 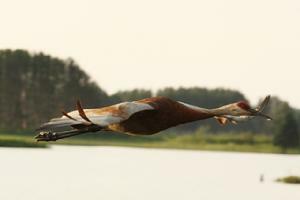 They nest on floating vegetation for up to 23 days. We must have been paying too much attention to the loon but we really had been looking for the cute little buggers all summer. Glad to have them here, hopefully, we can get some more footage of the little calico chicks (they really are tricolored like a calico). 8:00pm and it is 80 degrees as we enter the Refuge. The pool in front of the Visitors Center has a couple of male wood ducks feeding. F Pool is full of Canada geese and a mommy ring-necked duck with her chicks. The eaglets are in their tree, the osprey chicks are calling to be fed and a raven is being chased by its siblings as we start down the Fishing Loop Drive. The daddy osprey is fishing over H Pool. He nabs a fish and heads for his nest and his hungry family. J Pool loon and its chick are by the fishing pier. As we round the corner of G Pool we spot our family of loons teaching baby how to fish. The trumpeter swans have invaded the north end of G Pool now, too. D Pool loon is still on the nest with its mate nearby. There is also a pair of Sandhill cranes on the opposite end of the nest island. We find the little pied billed grebes still on C Pool. We now have four chicks! 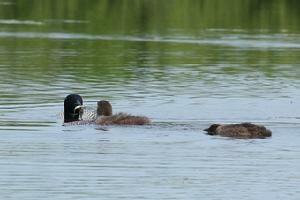 There is also a mommy ring-necked duck with eight chicks. Mommy is chasing a muskrat out of her area. As we reach the east end of C Pool we spot our pair of loons. They were bathing in the last rays of the sun as it set over the Refuge. Awesome! The other pair of loons is at the end of C Pool where the M-77 osprey is fishing. Before we finish our drive we spot a ruffed grouse. At 7:30am it is sunshine with hazy in the west. F Pool loons are back near the osprey nest where the two chicks are crying for breakfast. 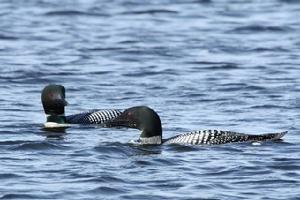 The two loons are on H Pool being enjoyed by two fishermen. The trumpeter swans on H still have five cygnets!! That is amazing to have that many survive. 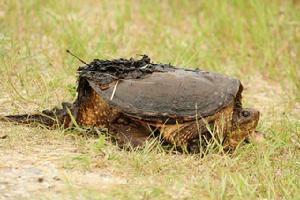 Usually the snappers or pike or eagle get more than their fair share. We spot a Bittern in the grasses along the F/J channel but not able to shoot it. There is a pair of Sandhill cranes in H marsh enjoying their morning constitution. One of the J Pool loons and their chick were near the shore but quickly moved away calling for its mate. It was definitely not happy with our presence there. So we moved on to see if our G Pool loons would still be tolerant of us. The G Pool loons were near the drive but the lighting was not the best. We still were able to get some shots of them and their growing chick. Last year the couple took their young to the backside of the pool so we weren�t able to get many pictures of them as they grew. But this year a pair of eagles built a nest back there so�yeah for us the loons are staying closer to this side of the pool. There are still lots of trumpeter swans living and eating on G Pool. They all seemed pretty content this morning. There were no major confrontations amongst them. We do have some common terns have a squabble over who gets to fish where. The kingfishers are busy swooping and chattering as they go. It is nice to finally see them this summer. This has been a very strange year with the cold wet spring. Everything is out of whack, very late nests for a lot of critters. We have a female Harrier over D Pool being harassed by several small birds trying to chase her away from their young which they succeed in doing. Our D Pool loon is off the nest again. The one is calling and calling in such a sad voice. We are wondering if the nest has failed. We decide to sit and observe. The mate slowly makes its way over to her. She seemed to calm down a bit but then he moves away and she starts back up. She seems undecided as to whether she wants to go back to the nest or not. At the same time we notice our osprey sitting on its nest quietly watching. We don�t hear the chick which makes us wonder if they have lost this year�s chick, too. We then have two loons flying over, one lands in the cove where the mate has gone. They couple didn�t raise a ruckus like they would normally do if they were on their nest. Curious. 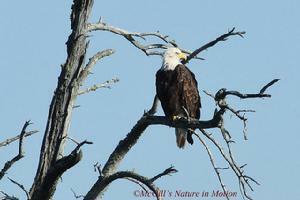 All of a sudden a bald eagle comes from the backside of the peninsula where it had been perched �fishing�. Now we know why the loon was off the nest. If she had stayed on the nest she would have been an easy target for the eagle. She would not have been able to quickly leave the nest if attacked. In the water she could quickly dive and escape the eagle. Once the eagle left the area she came right back and settled herself on her eggs. The other visiting loon took off as the male loon chased him reclaiming their pool. Wow, if we hadn�t sat and just quietly observed them, we would have assumed something entirely different then what really took place. This is what we love about nature, it is unpredictable and always amazing us with every twist and turn along the way. Our osprey came back to its nest to feed the chick who must have been told by its parent to lay low and be quiet. The loons are back on their nest and territory so all is well again on D Pool. We head down to check on the pied billed grebes on C Pool. We have one of the chicks out preening itself. So we get some cute shots. One of the parents makes a run through checking to make sure it is all right. The chicks look to be dispersed throughout the area each being in their own designated spot. As we are watching the grebes two loons fly over. 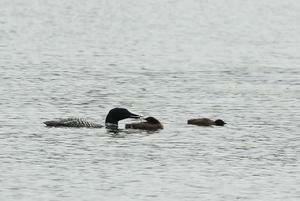 Now with several of the pools having unsuccessful nest the loons are starting to get social with each other. H Pool, E Pool and C Pool, sad to say, all had unsuccessful nests this year. Our C Pool loons who recently gave in to the fact that the nest had failed are back together. Last week when the female tried to call her mate, he didn�t respond even though he was just down at toward the end of the pool. We were worried that they would probably �divorce� over this but this week they are together again. We try to capture Kingfisher fishing off the end of one of the recently bulldozed jack pines which they love to perch on. But as usual it took off just as I got my camera on it. Nearby a huge fish leaped out of the water which, of course, happened too fast to capture either. 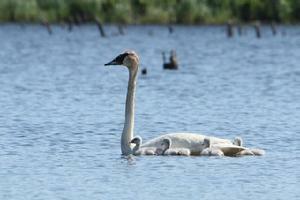 At the end of C Pool our trumpeter swans still have one of their cygnets yet. That is better than last year, they lost all of them in less than two weeks. Our east end loons are calling and carrying on. As we stop to see what the noise is all about, we discover a mature bald eagle soaring overhead. Then an osprey takes off out of a tree where it had been fishing to chase the eagle over to B Pool and beyond. A lone loon is on the small pool. 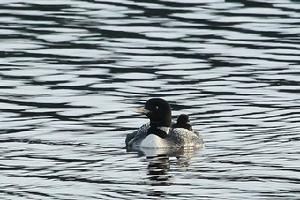 We think it is our old G Pool female who according to Seney�s loon specialist, Damon McCormick, was driven off by another female in May. Poor girl she lost last year�s mate to botulism in the fall. She had just found another mate when she got driven off her home of thirteen years. We shot her flying over G Pool last week. It is so sad to see. She is going from area to area hoping to find a new territory and a new mate in hopes of a better year next year here at Seney National Wildlife Refuge. The day got hot and humid so we decided to head over to the Toonerville Trolley. Dixie had found a rare orchid growing in the marsh right near the train tracks. She was in hopes it would still be flowering so we could get some photos for her which were able to do. At 7:00pm we decide to make a quick run through the Refuge to see how everything is fairing in this heat. 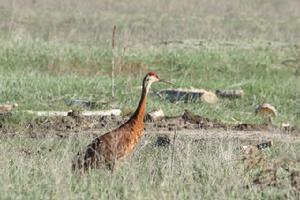 Frick and the chick, the local Sandhill cranes are out welcoming visitors to the Refuge by the entrance. F Pool is full of Canada geese. We spot a few wood ducks who are going through their morph right now so they look strange. The F Pool osprey is fishing for its hungry chicks again or should I say still. LOL! 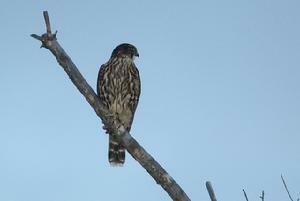 We have a female merlin sitting in the top of a dead tree in the E marsh. It is very hard to distinguish what it is or even see it on the dead tree. I was able to capture a few photos of it as it diligently hunted for its prey. But before it could satisfy its hunger several kingbirds drove it off by dive bombing it. Cool! 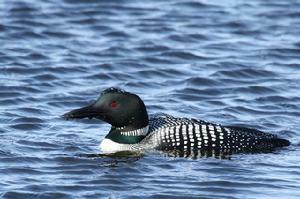 Our G Pool loons have moved to the south on the pool closer to the trumpeter swans (and the eagles). D Pool loon is still on its nest with its mate down in the cove under the osprey nest where one of the parents is standing guard. 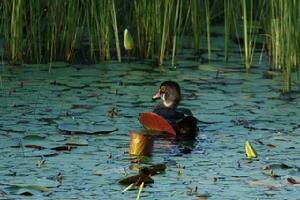 We have several wood ducks on C Pool along with busy beavers. The C Pool loons are together. Further down we have a pair of Sandhill cranes in the water near a pair of trumpeter swans. As we are watching them a fight breaks out between two ospreys wanting fish in the same area. As we quickly round the corner to see what happened to the ospreys we find a pair of sandhill cranes in the drive. They quickly move out of the way going into the marshes as we finish our drive. It is still 80 degrees at 9:00pm! We are up for a four day weekend!! We head into the Refuge around 8:20pm. We spot a Northern Harrier before entering the Refuge. 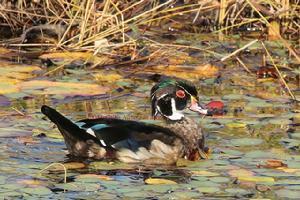 There is a molting male wood duck on the small pool in front of the Visitors Center. The eaglets are in their nest. We thought they should be off the island before now but� the parents must still be waiting on them. The osprey on F Pool was feeding its two young. There is a merlin chasing its dinner on the Fishing Loop. As we near J Pool one of the loons is wailing. When we check it out there was no young around. We spotted the second one out farther in the pool, chick less, too. All signs point to the loss of the chick. Sad. Our G Pool family is intact and together. Yeah!! An osprey flies over fishing. D Pool loons are in the far corner of the pool but we could make out that there were two chicks on the one�s back!! Sandhill cranes are on the island in the middle of D Pool. The C Pool loons are hanging out with several ring neck moms and their chicks scattered around the pool. Our pied bill grebe family is still together, too. 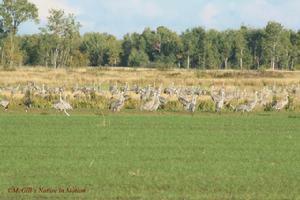 Sandhill cranes are in the B marsh. The east end of C Pool two loons are still there. Flickers and Kingfishers are everywhere. As we are leaving the Refuge we spot a lone doe in the marsh. We spent the morning on the Tracks of the Toonerville Trolley filming black bear, coyotes, eagles and more. We spent the afternoon filming the Tahquamenon Falls Riverboat along with Mr. Buck Levasseur of Discovering Michigan. We head into the Refuge in the evening around 7:15pm. We have momma ring neck with three chicks on F Pool as a loon flies over us. The osprey is fishing on the Fishing Loop as its two chicks call for their dinner. Another loon flies over as the osprey heads off to find a different fishing spot. There is still no sign of a baby loon on J Pool. How sad is that? Our G Pool loons are feeding near the shore. As we head down the pool we have kingfishers fighting. As we near D Pool we have two or three young kingfishers fighting and carrying on all around us. But they are still too fast to capture. Oh my goodness, the D Pool loon with its two chicks on its back is quite near the shore and the observation deck. That is so unusual for them, they are always even without chicks farther out in the pool. So we stop to try to capture a few moments before the sunsets or is covered back up with clouds. The mate eventually comes over we thought to exchange places with the one tending the young but�no. The one with the chicks on its back sinks in the water until the little ones are on their own then takes off with its mate out to the middle of the pool. They are acting just like their human counterparts; we�ve had the kids now it�s time to party. Whatever!! They leave the two little munchkins on their own at only 2-3 days old. Hopefully, we still find them here tomorrow. 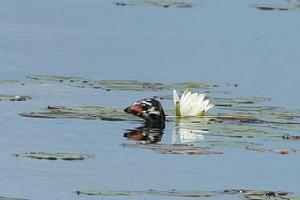 We have several wood ducks on C Pool along with lots of little ring neck chicks. The C Pool loon has company arrive; two loons fly in. The pied billed grebe babies are out near an island begging their momma for food. They are pretty loud for such little buggers. We have at least one of our east end loons at the end of the pool and a doe is across the drive in B marsh. The day starts out cloudy but when we see a break we decide to head into the Refuge around 9:30am. Both F Pool ospreys are in the nest tending the young. 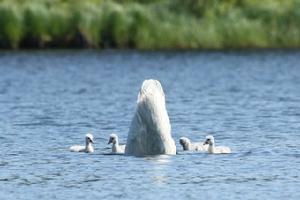 H Pool�s trumpeter swan family still has four cygnets. Sandhill cranes are flying over J Pool where only one loon is seen. The common terns are raising a ruckus as usual. We have a doe with two fawns that we can barely see in H marsh. We are glad to see more babies than last year. A northern harrier is soaring high above the west end of H marsh. A pair of young kingfishers are playing �catch me if you can� with us along the west end of the Fishing Loop. Our G Pool loons have the young one in �training�. They are diving and fishing around it, trying to teach it. It does dive but doesn�t seem to come up with anything. These are good parents knowing they have to be tough on their baby so help in survive come Fall when they have to leave it on its own. Just imagine the little tike is only three weeks old today! Yeah, the D Pool loon has its two chicks on its back! It is in the cove trying to stay safe and secluded from intruders. 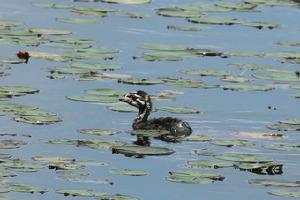 As we travel down C Pool we find our pied billed grebe chicks and another set of three smaller chicks with them. Cool! C Pool loons are in their usual spot. The pair of Sandhill cranes is still in B marsh. Momma ring neck just flew into C Pool where she had left her growing chicks. Interesting. We have fighting kingfishers at the end of C Pool along with squabbling common tern. We head out of the Refuge at noon to cloud covered skies. We decide to take a break so I catch up on journaling and our website. Clouds are still heavy in the sky so we head over to Munising. We spent the morning on the tracks of the Toonerville Trolley. We were greeted by a second year black bear peacefully lay less than one hundred yards from our blind. We headed into the Refuge at 1:00pm to partly cloudy skies. The F Pool loons were near the start of the Marshland Drive. We have an eagle flying over E Pool where a lot of trumpeter swans are feeding. A pair of Sandhill cranes was in C marsh. The west end loons were out farther in the pool chilling. The D Pool loons with their two chicks were over near the spillway. We headed over to watch them for a while. While we were there an osprey flew into the osprey nest. A few minutes later another osprey flew in. They chattered and squawked for a while then a third osprey flew over. The one osprey flew off as the third one flew into the nest. After checking over the photos we realized the chick had flown in to the nest to wait for the parents to feed it. It is strange we haven�t heard the chick begging for some time. We actually thought they may have lost the chick. But they were acting strange all season. They would fly over to the nest then head into B marsh to watch the nest from a distance. We think having the eagle nest on G Pool which is basically on the back side of D Pool is causing them to be extremely cautious. As we were leaving D Pool we ran into fellow nature photography enthusiasts, Laura Wong and Larry McGahey, gearing up to bike back into the Refuge backcountry. We had a very nice visit with them and our now fellow contacts on Flickr. 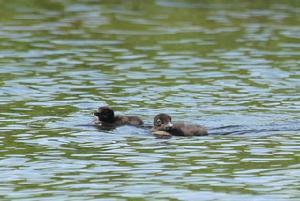 Our little pied billed grebe family was feeding in C Pool. It was fun to watch the parent disciplining the one young. She actually bit it on the back of its head as one of my photos showed. The C Pool loons were lounging in the middle of the pool without a care in the world as a storm blows around us to the southwest. 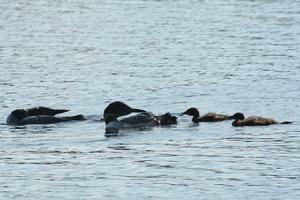 One loon was at the end of C Pool and a ring neck duck family was in the small pool. We decided to take a break to see what the weather was going to do. We headed back into the Refuge at 5:30 after the storm blew away and some blue skies reappeared. 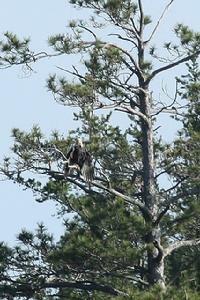 One of E Pool eaglets was perched in a dead tree 50 yards or so from the nest. We had hoped to have them a little further from the nest by now but�we will see, maybe the next time we come. The F Pool osprey chicks are being tended by one of their parents. There is a Sandhill crane in E marsh as kingfishers chase each other all around. 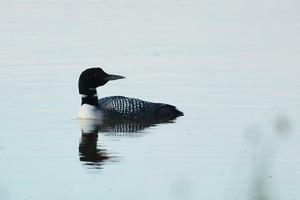 G Pool loons are too far to the north where the sun is making it impossible for photographing them. We have an osprey in the feeding tree. The D Pool loons are out by their nesting island. The grebe family is dispersed farther out. The sun is being swallowed up and darkness descends as we depart the Refuge. We wake up early to sun so we head into the Refuge. But� as soon as we start the Fishing Loop the dark clouds starting blowing in from the north. Needless to say I was really bummed out. This is our last morning and I was hoping for some good shots of the D Pool loons. When we get back up here in two weeks they will be almost three weeks old and no longer riding on their parents� backs. We have a loon flying over F Pool as the ospreys tend their hungry chicks. Wood ducks are in the E channel. The kingfishers are so entertaining. The young are chasing each other all over the Refuge. It amazing once again how we were worried about not seeing any earlier in the season. With the late spring we had and prolonged cold weather we think they were just much later nesting. Two loons are fishing on H Pool where the trumpeter swan family still has four cygnets. That is amazing to still have that many, most of them are lucky to have one left after pike, snappers and the eagles take their share. 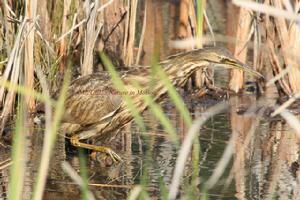 There is an American bittern in the F marsh but the lighting was not conducive for filming. 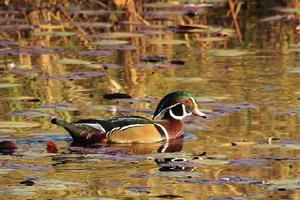 We have wood ducks throughout the H marsh area pools. Our G Pool loons and chick are feeding happily. As we round D Pool to join back up with the Marshland Drive we hear merlins screaming. 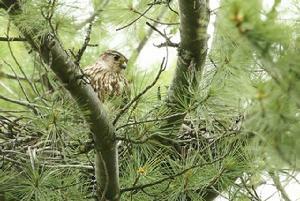 We stop to find two young merlins flitting about in the trees. We get out and spend the next hour or so filming and photographing these amazing little creatures. The two would fight with each other then fly over to a dead tree and scream then back to the pines. One of the parents came in quickly to drop off some food. The one grabbed it and gobbled it down as the other screamed and carried on. We finally moved on to check on the D Pool loon family. At first we couldn�t see them so I decide to take a short walk. There they were just around the corner in the cove trying to stay out of the wind. We shot a few photos of them as they headed out around the bend. We caught up with them later when a young eagle soared over the Pool causing them to come in closer to the observation deck. We found some very young ring neck chicks, nine of them to be exact, trying to be controlled by their harried mother. 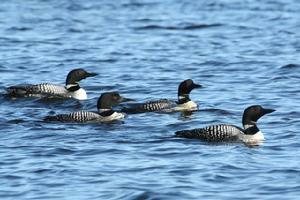 Our loons are still hanging out in their territory on C Pool as we head out of the Refuge. We will be back in less than two weeks too long for me but we have two special little visitors coming to spend the next weekend with their Great Aunt Teresa and Uncle Mike J. They are our future conservationist so it is very important to instill our values of nature and the environment with them. The clouds are moving in as we enter the Refuge at 8:00pm. It is 76 degrees and humid. The F Pool loons have divided up their duties. Each adult has one chick with them. Interesting. The E Pool eaglets are in the trees near the nest yet. The Canada geese are everywhere. The kingfishers are fishing, the Eastern kingbirds are feeding on bugs and the F Pool ospreys are waiting. One of the osprey parents is fishing on H Pool where the trumpeter swans still have four cygnets. There are three loons on the backside of the pool. Wood ducks are in the F channel. J Pool has one loon swimming as a Sandhill crane and trumpeter swans are on an island. 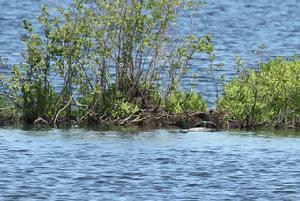 A momma ring-necked duck is watching her four growing chicks as E Pool female bald eagle watches them. We stop to film her and she takes off to hunt on E Pool. We didn�t spot our G Pool loons but there are just a few trumpeter swans on the backside of the pool. A few wood ducks, muskrats and ring-necks are also occupants. One of our D Pool merlin is hunting in the dead tree on the Marshland Drive as the D Pool osprey fishes from a pine tree further down. 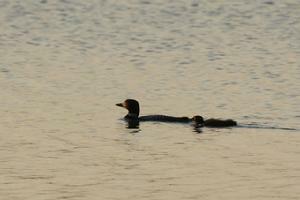 The two pairs of loons are still in the respective areas on C Pool as the light fades. We head out to hope for a decent day tomorrow. Overcast and rainy morning so we didn�t head into the Refuge till 1030. It is 69 degrees and breezy. A lone loon flew over F Pool. One of F Pool loons was just coming up from a dive and was not happy. 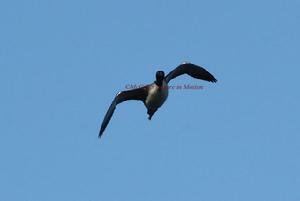 The loon continued to fly over to I Pool. The E Pool eaglets are still hanging around their nest area. A osprey flew over us from F Pool. Its family is waiting for it to come back with some eats. 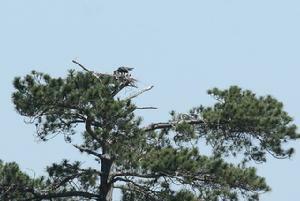 One osprey is in the nest the other one is on another island in a tall pine. The F Pool loon is finally coming over to join his family. Common terns are fishing throughout E & F Pool. The flying loon finally settled down and landed on H Pool. J Pool loon is still protecting its territory. Its mate flew into J Pool just after we went by. An osprey is fishing on G Pool. Our loons are further down to the south. The baby is now over a month old and in the ugly adolescent stage but still being feed by its parent. We have quite a few trumpeter swans and Canada geese on D Pool. One of the loons is in front of the observation deck. The other parent is in the cove with the two chicks. Yeah! They are both alive and doing well. 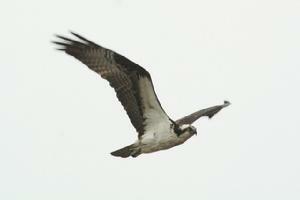 One of our D Pool ospreys is flying over B marsh. 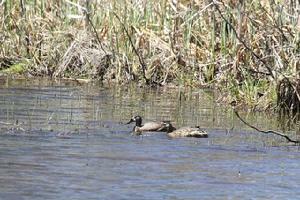 We have wood ducks in C marsh. Our pied billed grebes are still in their usual territory along with a ring-necked family and some wood ducks. C Pool loons are in the same exact spot that they usually are in. A merlin is hunting on B marsh. 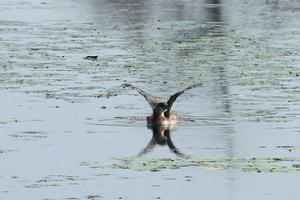 We have one of our juvenile pied billed grebes down farther on C Pool. It must be on an adventure all by itself. The clouds are still hovering over the Refuge. The skies look clearer to the west so we are going to head over to Munising. Frick and the chick Sandhill cranes are out on M-77 to the north of the show pools. We returned to Seney to find the clouds breaking up! It is 77 degrees and beautiful. The F Pool loons are at the start of the Marshland Drive where an osprey flew over fishing. The osprey�s chicks further down on F Pool are letting their parent know they are hungry yet again. J Pool loon is hanging in the same area that it has been. There are a few trumpeter swans throughout the pool also. The D Pool loons are actually very close to the shore near the observation deck. Unfortunately the light is not good for photo ops, of course. The D Pool osprey is soaring over B marsh another is over C marsh. The C Pool loons are close to the east shore but not good for photo ops. 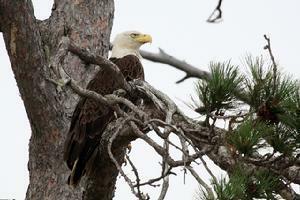 A mature eagle is in a tree above the old nest on B Pool. We have the little pied billed grebe further down C Pool. The sky is clearing so we decide to make another run before the sunsets. The F Pool loon family is still at the beginning the pool where there is also an American bittern hunting. Michael spooks it and it takes off. 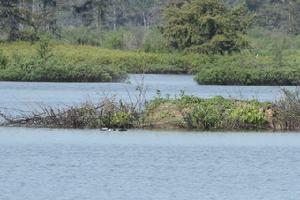 Common terns are fishing on E Pool where one of the eaglets is sitting in a tree away from the nest. One of the parent is fighting over F Pool with an osprey. I think the osprey lost. The eagle flew by with a big fish in its talons and took to a tree to eat by itself. There are a number of wood ducks on E Pool. The J Pool loon seems to be �anchored� to the same spot in the Pool all weekend. Strange! 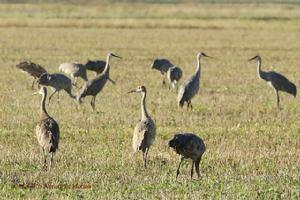 Sandhills in G Marsh to northwest. G Pool loon and chick are near the drive but once again light is not good. Daddy loon calls to alert them of an intruder. We have sandhills flying into B marsh and one into C marsh. We have four loons socializing on C Pool. We decide to stop and watch them for a while. We then have an eagle chasing an osprey across the pool. 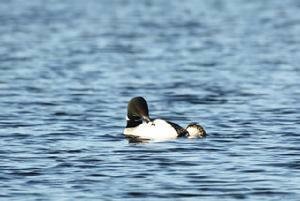 The loons aren�t happy with that they hoot but keep socializing. The eagle returns a short time later with a fish. Maybe the osprey�s ? We have another loon flying and then landing on C Pool to join the party. A little while later a sixth one joins them. They continue to move toward the east end of C Pool. The sunset is spectacular as we continue to watch the loons. 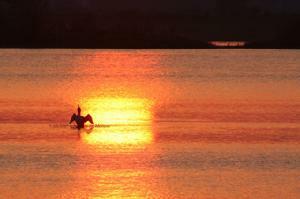 As the glow of the sun is left in the sky a mature eagle flies over giving the loons something to complain about. Then yet a seventh loon flies into C Pool to continue the party. As the sunset glows is leaving the sky we leave the Refuge behind till next weekend. We finally, after a few delays, head into the Refuge around 8:15pm. The skies have cleared and the sun is setting with its usual haze. There are wood ducks bobbing back and forth in the pool in front of the Visitors Center. Sandhill cranes are in F Pool along with lots of Canada geese. The E Pool eaglets are sitting in their nest screaming for food. Maybe the parents are finally starting to force them into fending for themselves. 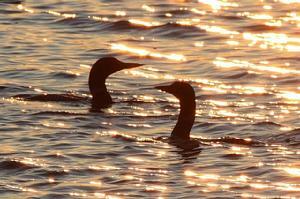 We have three loons on the east end of E Pool socializing in the sunset. An osprey flies over fishing. Trumpeter swans are feeding along the shore of E Pool. A merlin is hunting in the waning light. The osprey on D Pool is in a tree near the nest and another one in the nest. Two does are grazing in B marsh while Sandhill cranes cackle in distress. Three Sandhill cranes fly from B Pool over C Pool heading north. 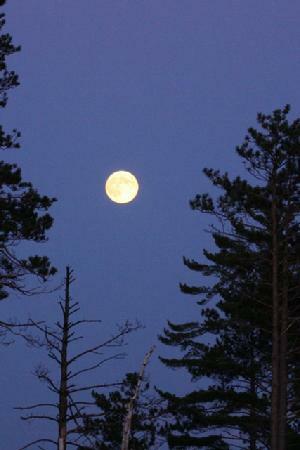 We head out of the Refuge with a full moon shining. It is a gorgeous morning with sunshine and 53 degrees at 7:30. Oh my gosh!!! 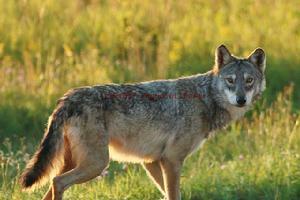 We have a young wolf near the Wigwams!!! We were able to get some good shots and good footage. Frick and the chick weren�t too far from where the wolf was. They flew off into the Refuge. A Great Blue heron flew off to the east. There is another Great Blue Heron flying over F Pool. 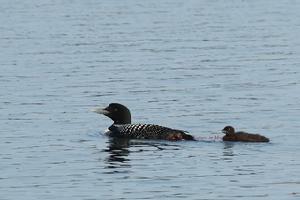 The loon chicks are near the corner of the Fishing Loop on F Pool. 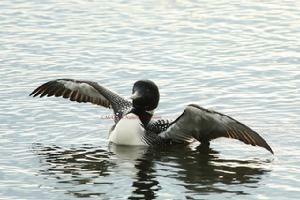 Another loon flew into F Pool. The Canada geese are everywhere being very active and noisy. 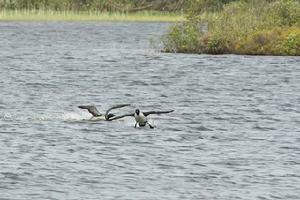 Loons are flying everywhere around the Refuge. There are three loons on J Pool. We have four sandhill cranes in H marsh and ring-necked ducks in J channel. Our poor G Pool loon chick appears to be all alone. But no�its parents are socializing with four other loons further down to the southwest corner of the pool. Awesome!! I take a walk back near the G/D spillway to photograph the six loons and Michael sets up along the drive to film them. We had quite a show and got lots of great shots!!! 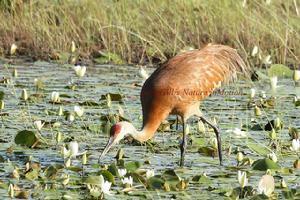 What a great day in Seney National Wildlife Refuge and it isn�t even 9:30am. Moving along D Pool has an eagle in a tree on the osprey peninsula so I decide to see if I can snap few shots of it. I manage a couple of shots before she takes off fly right over D Pool loon chick and its parent. That sets loons into fits. The parent corrals the young into the cove near the spillway. A Merlin flew over as trumpeter swans fly around the pool. Four wood ducks scatter out of another cove. The ospreys soared overhead. C Pool has quite a few wood ducks on it. An osprey is in a dead tree in B marsh. Kingfishers are hovering and fishing over C Pool. The loons are in there usual area. Pied billed grebe family w/four young is near the drive at the east end of C Pool. 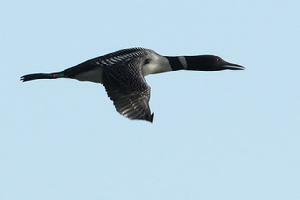 Loons are still flying and carrying on. The clouds are starting to move in around 10:30am. Our trumpeter swan family still has there one precious cygnet with them. We start our second run through at 11:15 with an American bittern flying into the brush along F Pool. Michael was able to get some footage of it as it flew off. F Pool loon chicks are still in the same area and still alone. Strange, ABJ is usually more attentive then that. One of the adult eagles is near the nest. The osprey chicks are awake and begging for food. G Pool chick now has one parent with it now. D Pool is still full of trumpeter swans and Canada geese as the one remaining loon chick is staying safe in the cove near the observation deck. Yeah! Our C Pool loons are near the east end of the pool where they entertain us and allow us to get some footage of them enjoying each other�s company. 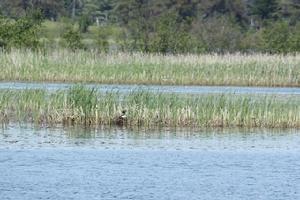 We still have pied billed grebe chicks in the area as we watch the two young eagles soar together in the blue sky! What a great day and it is only 3:00!! We are going to take a lunch break and try to get some photos up on Facebook etc. The first evening run through wasn�t quite as active. 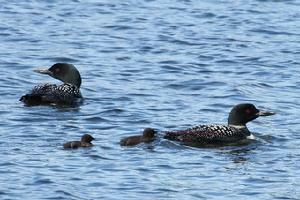 The most unusual change was the F Pool loon chicks were split-one on the Marshland Drive and one on the Fishing Loop. Our last run through at 7:00pm we meet Sara walking her two dogs. It is definitely a great night for a walk. The eaglets are in separate trees on the Eagle island and one adult is flying over. We find the other parent further down E Pool in a pine tree out of sight of the nest. We have two loons on the east end of E Pool and one further down to the west. We finally spot an American bittern in the marshes near the end of the drive!! I have to add my flash in order to get some shots but it works. As we are heading past the Wigwams we find our wolf is back. We find out it is a she!! I get a couple of decent shots of her. What a way to start and end the day!!! Once again a fantastic day in Seney National Wildlife Refuge!! I got out of work a few hours early so we were able to head into the Refuge around 6:00pm. 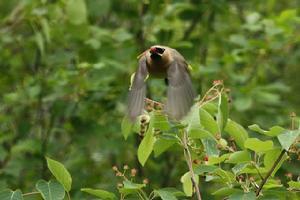 We were greeted with cedar waxwings chasing each other around. A couple of kingfishers are fighting over E Pool where one of the eaglets is sitting near the nest. The osprey chicks are still around the nest, too. ABJ and his young were sleeping nearby in F Pool. There are lots of trumpeter swans and Canada geese are scattered throughout the pools. 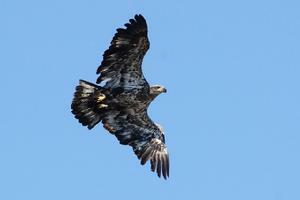 We have one of our eaglets flying over toward D Pool. C Pool has a couple of dozen wood ducks bobbing around. 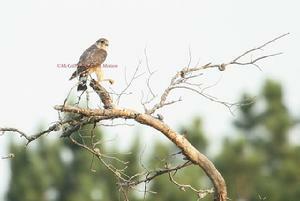 There is a Northern harrier hunting over B marsh where the osprey young from D Pool is sitting in a dead tree. Pied billed grebe families are in their two separate locations on C Pool feeding. We have a loon flying. A merlin is hunting beyond the small pool. We spot an American bittern in the marsh near the end of the drive. I was able to get a few shots of it in the waning sunset as we end our run for the night. We woke up to black storm clouds, so we didn�t head into the Refuge till 9:00am to partly sunny skies, windy and 55 degrees. We have a great blue heron flying out of the Refuge heading east. An American bittern flew over the North Show Pool into the South Show Pool. We have wood ducks in the pool in front of the Visitors Center. As we start the drive we have loons flying over J Pool. 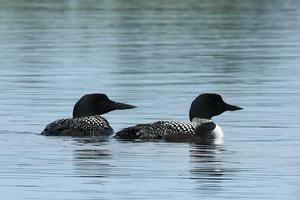 F Pool�s young loons are near the Fishing Loop drive resting. We have hungry bald eagle fledglings begging from their nesting tree. An osprey is in a dead tree on the backside of F Poo. The adult ospreys have possibly already left heading to South America for the winter. They leave the young once they feel they can take care of themselves (or not). The H Pool trumpeter swan family with their four young is all doing well, enjoying the pleasant morning. 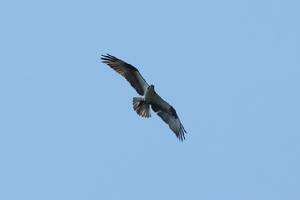 An osprey is fishing over J Pool where four loons have gathered to have a little party. 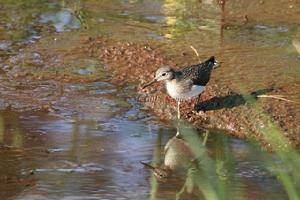 We have a small shorebird on the H marsh side feeding. 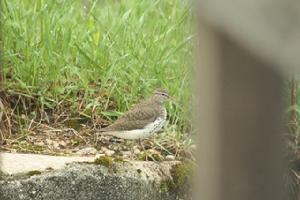 We find out it is a Solitary Sandpiper which migrates through back from its summer home in Canada. 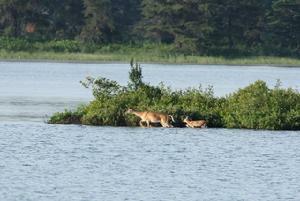 Further down in H marsh we spot our doe with her two growing fawns. We spook up a sharp-tailed grouse along the drive past G/J spillway drive. The G Pool eagle just took off from its perch at the northeast end of G Pool flying over to E Pool. Oh, that could be a dangerous move. E Pool adults will not be happy about an intruder into their territory. One of the G Pool loons with its young is near the drive on the east side of the pool along with two Canada geese family who do not want to get out of our road. We spot another American bittern at the west end of E Pool. Michael was able to get some footage but the little was so not right, of course, for any good photo ops. The D Pool loon young is in the calm safe cove area, hopefully, out of harm�s way. The rest of the pool is full of trumpeter swans and along with a few Canada geese. A pair of Sandhill cranes flew off over B marsh as we drove by. We stopped to check out all the wood ducks on the start of C Pool. They are back in too far for any good filming. We have a Merlin hunting, flying along the edge of C Pool. Further down we have a loon flying over going toward M-77. We have a pair of wood ducks in the cove. It was perfect lighting and still waters so I got a couple of decent shots. Further down we spot one of our littl pied billed grebe. 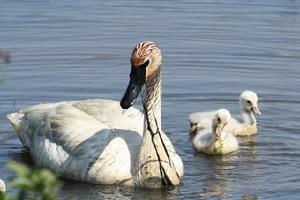 At the end of C Pool we have our trumpeter swan family with their one young feeding. We took a weather break and headed to Munising. 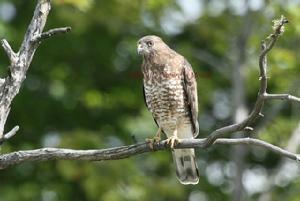 We found broad- winged hawk hunting along the highway. 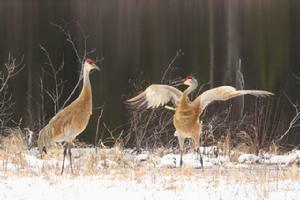 Near Lake Superior we found a pair of Sandhill cranes feeding along the road. We headed into the Refuge around 5:00pm to mostly sunny skies and 68 degrees but very windy. We have three Sandhill cranes flying over F Pool. One of the fledged eagles is sitting in a tree near the nest. One of the fledged ospreys is sitting in its nest. 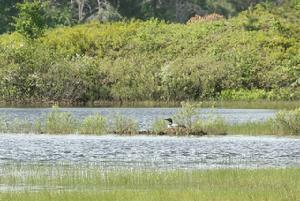 One of F Pool�s young loons is sleeping along the Fishing Loop. The Solitary Sandpiper is still feeding in the same area. Mallards and ring-necked ducks are in J channel. 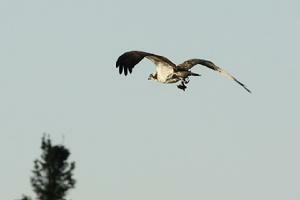 Around the corner in H marsh we spot an osprey eating a fish he had caught from G Pool. We have a kingfisher fighting a merlin on C Pool. It was cool to watch. The merlin finally gave up and moved on. The kingfishers are fighting and squabbling with everything including us! LOL!! A lone sandhill crane is on a ridge in B marsh. The pied billed grebes are staying out of reach. 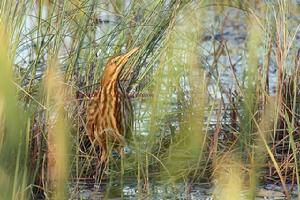 As we head out of the Refuge we have an American bittern in the marsh. We make another run through. The little birds are out eating bugs. The winds have died down a little and the skies are clearing off. 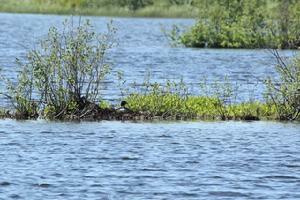 We took the Marshland Drive where we have two loons at the east end of E Pool. There isn�t a lot of action except kingfishers and other little birds fighting. 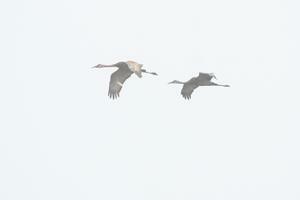 As we head out of the Refuge we have a pair of sandhill cranes flying into the Refuge. Spent the morning on the tracks of the Toonerville Trolley. Had a great day! A big male black bear, a young coyote, two nice bucks and momma black bear and her three little cubs. Head to the Refuge around 3:30 to sunny skies and 74 degrees. Unfortunately, found a male merlin killed on the side of the road near the wigwam. We were greeted by ABJ on F Pool feeding his two offsprings. The osprey fledgling still hanging out at the nest. We have a pied billed grebe on H Pool. G Pool young loon was hanging out by itself near the drive. 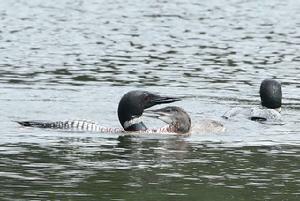 D Pool young and one parent loon feeding it out near the drive. Lots of trumpeter swans have taken over D Pool. We also have an osprey fishing overhead. Lots of wood ducks on C Pool but back near the marshes, too far out for photo ops. Our one pied billed grebe family out too far, too. The flickers and kingfishers are bouncing around all over the Refuge. We have fun watching one of three pied billed grebes at the end of C Pool as it bathed and preened. We were able to get some cool shots of it. We headed out of the Refuge about the time the clouds started to cover the sun. We woke up to clear skies which surprised us. It was overcast last night. So we headed into the Refuge around 8:30 to 66 degrees and sunshine. A pair of sandhill cranes was on an island on F Pool. One flew off and left the other one staring after it. ABJ and his young are in the middle of F Pool via the Fishing Loop where the osprey fledglings are being feed by one of the adults. The adult ospreys should be leaving soon to winter in South America. It is a long arduous trip filled with many perils. The young have to make this trip on their own. Many do not make it. We have another osprey actually fishing on H channel where we never see one, possibly one of the young in training. We have an eagle along G Pool hunting from a dead jack pine. 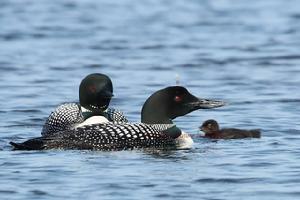 The adult loon is not happy and staying close to its young. We stop to film them for a while. The eagle quickly left to hunt on the other side of the Pool which made the loon more at ease. 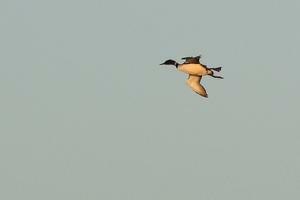 As we were heading back to the vehicle the adult loon suddenly took off right in front of us. I was able to get a few shots off as it went by. It flew over to E Pool where is landed. Maybe there is a party going on over there with the adults socializing. It is definitely get to be that time of year. As summer wanes the Refuge goes through a quiet more tranquil time. The parents have raised their young to near adulthood. 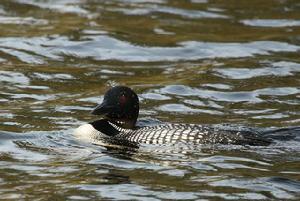 The female loons have left first to gather in nonterritorial waters before heading off to their wintering grounds. The males remain until September to finishing training their offspring in hopes they will be prepared to leave on their own in October. We spotted a couple of Northern harriers around the Refuge. They, too, are preparing to migrate south to better hunting grounds come winter. The trumpeter swans and Canada geese are devouring D Pool. 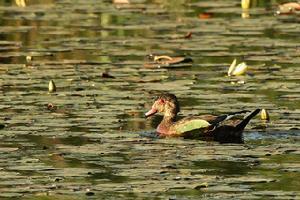 The wood ducks, pied billed grebes and ring-necked duck families are scattered throughout C Pool. 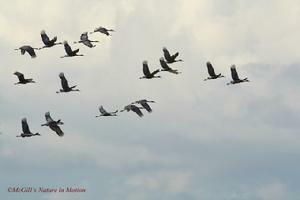 As we end our run two sandhill cranes fly into the Refuge as a loon flies out of the Refuge at 11:00. We are back a day earlier than expected. We are so thankful to be able to come up again so soon. We head into the Refuge for a very quick run through at 8:00pm. The clouds cover the sky but the sun peeks out just as we enter the Refuge. It disappears again quickly but leaves a glow even above the dark foreboding clouds. We spot our elusive American bittern in a small pool at the start of the drive. I was able to snap of couple of shots in the waning light. A few trumpeter swans fly over E Pool just stretching their wings and back to where they started. One of the E Pool eaglets sits high above the nest watching and waiting. There are ring-neck ducks, Canada geese, trumpeter swans, muskrats and beavers all peacefully feeding in the waning light. Loons are flying and calling, sandhill cranes are cackling and the smell of Fall is in the air. The bracken ferns are turning brown, the golden rod is blooming and the milkweed pods are full. To everything there is a season. We spent the morning on the tracks of the Toonerville Trolley checking on our momma black bear and her three little ones which are doing well. We headed into the Refuge around 6:00pm with the sunshine and the wind blowing as it has all day. A Great Blue Heron was on F Pool which is a sight we haven�t seen much this summer. It was so nice to see one. 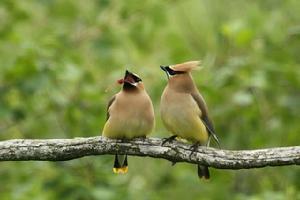 The cedar waxwings are flitting about. We snapped a few cool pics of them. One of F Pool young loons is preening near the Fishing Loop. The young ospreys must be out looking for food. 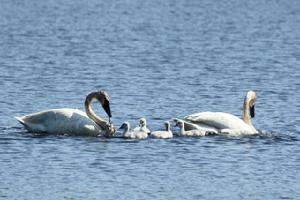 The trumpeter swan family is together on H Pool. Sandhill cranes are further down in the marsh area of H Pool. 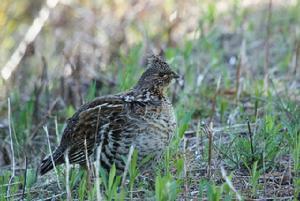 We spot a sharp-tailed grouse strutting down the drive near end of H/J area. Our G Pool young loon just caught a fish as we drove by. It�s nice to see it can take care of itself. We have one of the young ospreys on the feeding tree on the west end of E Pool. It is sad to see the young critters being left alone to try to make it on their own. It is for their own good but still sad to see. I can�t help but worry that they may not make it to their winter grounds especially now with the threat of severe weather conditions. The young loon in D Pool is safely tucked in the cove out of the wind. 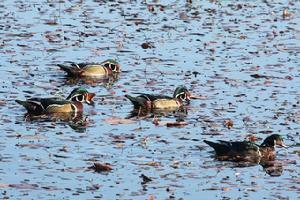 We have wood ducks throughout the Refuge but especially in C Pool. Yeah!! We have two great blue herons near each other on C Pool!! We have sandhill cranes and pied billed grebes further down in C Pool. We spot an adult bald eagle in a tree along the Marshland Drive. We have a Merlin flying around trying to find something to eat. And we have yet another great blue heron in B Pool!! We hear a loon calling as the sunlight wanes. As we finish our run through we spot our doe on the ridge past the marshes. Another beautiful day in the Upper Peninsula of Michigan!! We head to the Refuge around 7:30am. As we entered the Refuge, Michael realized he forgot his hat. So back to the trailer we go. But....as we past the Wigwams we see not one but two gray wolves!!! ...They quickly ran into the brush before I could get a pic of both of them. One did step out long enough for me to get one shot. Awesome!! The hat was retrieved and back to the Refuge we head. 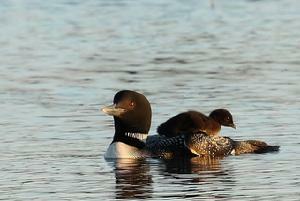 The daddy loons were tending their young. The Sandhills are flying, wood ducks and pied billed grebes feeding, American bittern flying. It is a great day to be here!!! 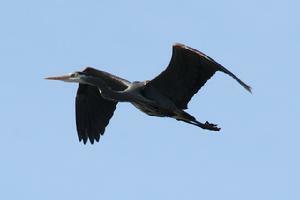 We spotted a great blue heron flying out of the Refuge this morning heading east as we have seen it do in the past. Frick and the chick (sandhill cranes) are along M-77 when we come back from getting Michael�s hat at the trailer. Another pair is at the entrance by the sign but flies over to the east. Kingfishers are chattering and flying staying just out of our reach. ABJ, the daddy loon, is on F Pool near the Fishing Loop working with one of his young on its fishing technique. We hear the young osprey on F Pool who is sitting near the nest screaming for someone to pay attention to it. Another osprey, probably its sibling, is eating a fish in a tree near the shore. It finishes that tasty morsel and flies over us to look for more. Another great blue heron just flew into the F marsh. As we go by H Pool and it flies over then circles back to F Pool. H Pool has three pied billed grebes popping up and down. I love to watch them submerge like submarines. We have a lone loon calling on J Pool amongst the trumpeter swans. The bluejays are flocking up all around the north. The red squirrels and chipmunks are diligently gathering their goodies to fill their winter coffers. 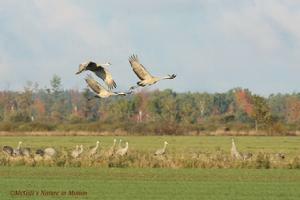 We have a noisy pair of Sandhill cranes flying out of H marsh. No, make that two noisy pair of Sandhill cranes flying out of the marsh. A young osprey is trying to fish over G Pool but doesn�t like our interrupting it so it flies into H marsh. Another young osprey is in the feeding tree on E Pool patiently waiting for something to tempt it. 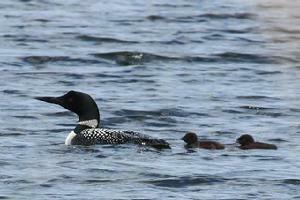 Our D Pool daddy loon and its one surviving young are near the shore!!!! And the sun is shining on them!!! Daddy loon has a fish he wants to feed the young, but the young is not interested. So daddy eats it and then zips his feathers and preens for us!! Sweet!! We photographed them for about half an hour which is a long time for D Pool. We have another great blue heron in the marshes of C Pool along with the wood ducks and an American bittern that takes off. Further down the way we have our pied billed grebes and more wood ducks. As get ready to cross the bridge on the C/B spillway a big beaver waddles across the road. Unfortunately, Michael was paying attention!! He missed it completely and I couldn�t get my camera up fast enough to get a shot of it. Pooh! We have another osprey fishing over B pool along with a few bobbing wood ducks. Toward the end of the drive we spot our American bittern in the marsh but not able to get photos. Maybe later today after we take our midday break we will see it again. It is another gorgeous day in the Upper Peninsula of Michigan at Seney National Wildlife Refuge!! The temperature is 45 degrees but the sky is clear and the water is still. It is so nice to finally see our Great Blue Herons in some of the familiar haunts of days gone by. We have one in the reeds on F Pool just as we enter the Marshland drive. The trumpeter swans with their two cygnets glide across the glassy pool. A loon is calling over on E Pool with another loon further away answering it. 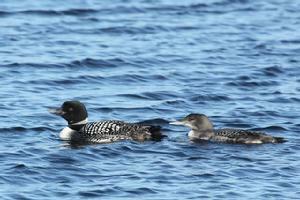 That is also a pleasant surprise because a lot of the adult loons have disappeared from the pools. They are already heading toward their wintering grounds. The females leave first then the males without young. 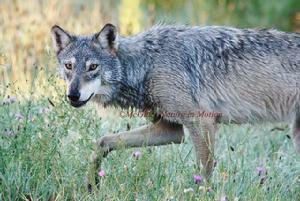 The males with young will head out once they feel their offspring are ready to be on their own. ABJ, the F Pool loon and one of his young are feeding near the Fishing Loop entrance. 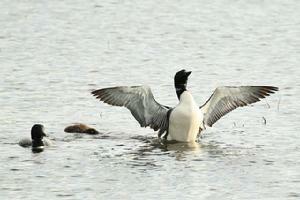 As we are watching them another loon quietly lands right next to them! It bobs around a little bit then as suddenly as it landed it takes off! Interesting!! ABJ didn�t even say anything. A trumpeter swan from F Pool takes off coming right at us. It flies over E Pool then comes back to F to chase some Canada geese out of its space. After the geese leave it becomes content again and continues feeding. 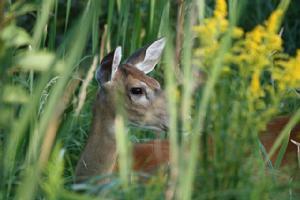 A doe is peeking out of the brush on E Pool near the channel. 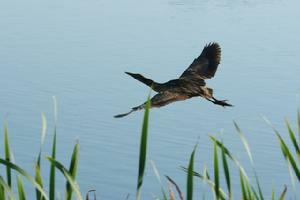 A great blue heron flies into the marshes of F Pool. It is a great day to be at Seney National Wildlife Refuge!! 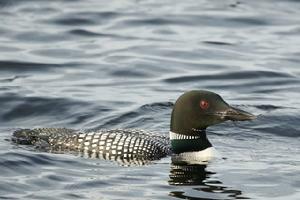 J Pool has one silent loon amongst the trumpeter swans and Canada geese. As we near G Pool the smell of smoke permeates the air. There must be a prescribed burn to the west of us on the Refuge. Our young loon is in the west corner of G Pool heading up toward its feeding area near the drive. Our D Pool daddy loon and young are heading out to the middle of the pool where the mass of trumpeter swans and Canada geese are feeding. As we round the corner to C Pool we have a pair of Sandhill cranes flying right as us. I was able to get a good shot off of one of them. Sweet! The wood ducks and a great blue heron are feeding in the usual spot. 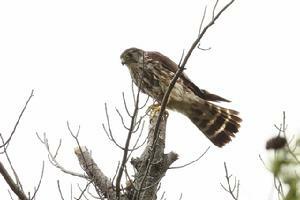 A northern harrier is hunting to the north of us on C Pool but doesn�t come back our way. Yet another great blue heron is further down the pool. Kingfishers are flying and hunting just staying ahead of us as usual. Muskrats and beavers are floating and enjoying the peaceful waters. Blue jays and red squirrels are chattering and fighting each other. 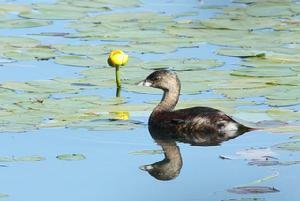 Our pied billed grebes are throughout C Pool. The one family is in the little cove toward the end of C pool. We are able to get some awesome reflection shots of one of the adults and one of the young!!! Awesome!! Further down the trumpeter swan family with one cygnet is relaxing at the edge of the pool with one of the little grebes keeping them company. A merlin shoots in front of us as we head toward the end of the pool. An osprey is fishing and cedar waxwings are feeding over C Pool as we head down the drive. Yeah!! 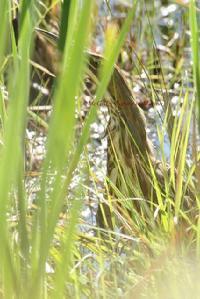 Our American bittern is in the marsh!!! We are able to get some awesome shots! The sun was shining right on it!! We were surprised when a second one flew up but weren�t able to get a shot of it. I did get a bit of its wing in a photo with the other bittern. LOL! As we end the drive we have a pileated woodpecker fly in front us and several blue jays are squabbling. Then we get a nice present as a banded osprey is fishing on the North Show Pool. If I hadn�t forgot my photos at the trailer to show the girls at the Refuge we wouldn�t have gotten any photos. We take a break to go visit our friends at the Refuge Visitors Center. We haven�t had a lot of extra time to do that this summer (it�s been such a good year for wildlife!!). Always great to see Pat!! Nice to visit with Sue and Jan, too. Also nice to see Interns Karen and Mandy who seemed to being really enjoying their time on the Refuge!! It is so darn nice we can�t resist taking one more spin around the Fishing Loop. LOL! F Pool young loon is near the shore, the trumpeter swan family is near the spillway where one cygnet proceeds to bite its parent! We have a pied billed grebe on F Pool. Then we hear an osprey carrying on. We look over E Pool and we have an osprey and a juvenile eagle soaring. 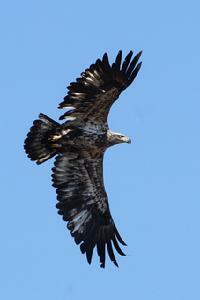 The juvenile eagle flies right over us!! Hopefully, we got a decent shot or two. This is the closest we have been able to get to these little buggers so far this year. Another pied billed grebe on F Pool further down. 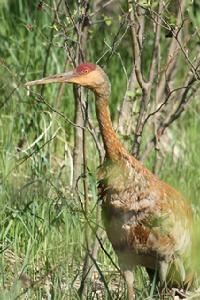 We have Sandhills in F marsh feeding in the cattails. We have two pied billed grebes in H Pool. We have yet another pied billed grebe in J Channel. The little guys must be on the move now that they are bigger. Our G Pool young loon is in its normal area. No sign of the daddy the last two days. More pied billed grebes in the west end of E Pool near the spillway. We have a great blue heron in C pool with all the wood ducks. 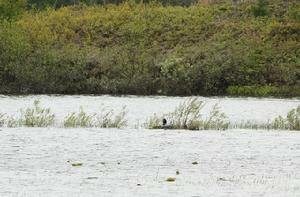 We have five pied billed grebes in one area, then three in another and two further down. An osprey is fishing over the end of C Pool where a couple of families of ring necked ducks are feeding. We end the run and our stay till another day. We woke up to some ground fog and then a few clouds diminishing the morning sun. It is 53 degrees at 7:40am. We have a pair of Sandhill Cranes on the South Show Pool along with lots of Canada Geese feeding on the lowering waters. F Pool is in a slight fog with beaver and muskrats skimming through the waters. Our trumpeter swan family with two cygnets is hurrying to their morning breakfast. Ring necks and pied billed grebes are feeding along the shoreline. The red squirrels are jabbering and arguing with each other over whose territory it is. The blue jays, crows, ravens, flickers and kingfishers are making their presences know. They are saying �wake up you sleepy heads. It�s a beautiful morning�. Wood ducks are feeding on E Pool as a lone osprey calls from its former nest. Another osprey is fishing over H Pool to D Pool to E Pool without stopping to visit. H Pool has Canada geese, wood ducks and a Northern Harrier flying over it. Canada geese, trumpeter swans, wood ducks, ring necks and mallards on J Pool. 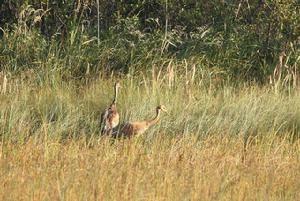 At the end of J Pool near the marsh we have a pair of Sandhill Cranes with a colt (young). This is the first young we have seen to have survived this late in the season. 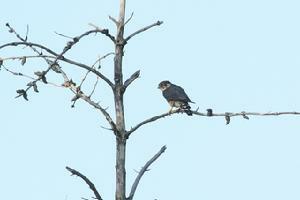 We also had one merlin hunting from a dead tree being hassled by the blue jays. Another merlin was hunting down a little further. We spot some gray jays in the tall trees at the end of J/H marshes. We notice G Pool is getting lowered. So we have a few more Canada geese feeding along with some ring necks. Yeah! What we thought to be our G Pool loon chick was actually a red necked grebe!! We got quite a bit of footage of it as it took off and flew around the pool then back. I did get closer to it for some good shots before it flew off again. This time it circled us twice before heading over to E Pool. Sweet! In the meantime Sandhill cranes flew over us from G to E then back to G Pool where another pair was cackling across the Pool. At the other end of G Pool we have four pied billed grebes. We also have five pied billed grebes on the west end of E Pool. Sweet! D Pool is still inundated with trumpeter swans feeding. 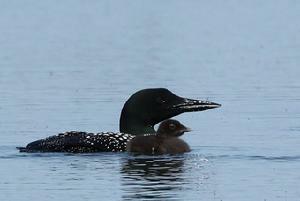 Our D Pool daddy loon is still watching over his young who looks more like a grown up loon now. It has finally lost all of its baby fuzz. Daddy is starting to lose his summer plumage. It won�t be long before he heads out for his winter grounds. Hopefully, the young one will be ready to be left on its own. 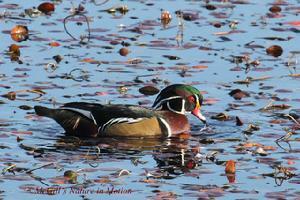 C Pool has numerous wood ducks, pied billed grebes and ring necks throughout the drive. Sandhill cranes fly over B marsh. 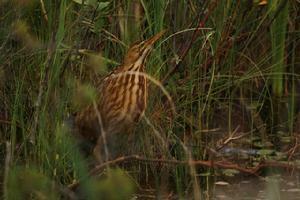 And as we are near the end of the drive, our American bittern is feeding in the marsh. While I was photographing it another bittern flew out and startled. That was the end of that session. We headed back to the trailer around 12:00pm to cloud covered skies and 80 degrees. We took a midday break and headed to Munising. The clouds had descended on Seney but not on Munising. The sun was shining on the bay, the boats were everywhere and people were actually swimming in Lake Superior! We returned to Seney to find the clouds departing and the dust settle on the drive from some showers. A beautiful male wood duck greeted us from the pool in front of the Visitors Center. He is coming out of his �eclipse� and back into his beautiful breeding plumage. An osprey on F Pool was screaming for food or else it didn�t like the juvenile eagle that was sitting back behind its nest. Another osprey was fishing over E Pool. Not a real active evening, the temperatures still very warm. 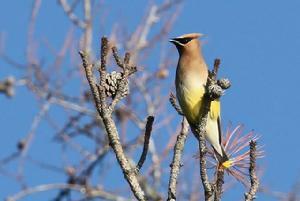 We photographed some Cedar waxwings who decided to pose for us. The Merlins weren�t so co-operative. We had a sharp-tailed grouse wander across the drive in front of us but disappeared into the underbrush. 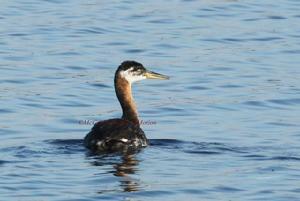 Our red necked grebe was back on G Pool. We were able to get a few shots of it as it took off. 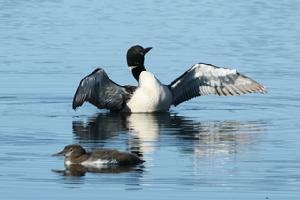 They use a bit of water surface to take off, too, similar to their �cousins� the loons. 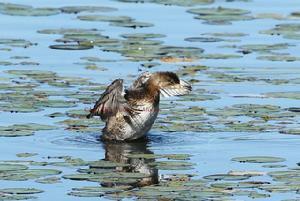 Pied billed grebes are scattered throughout the Refuge. It is so nice to see so many. We think some are probably passing through. We count around twenty of the little guys. We have only been seeing about ten on a regular basis. Trumpeter swans fill D Pool. They are carrying on and flying and landing. 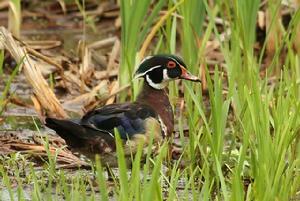 The wood ducks are bobbing around C Pool marshy areas. 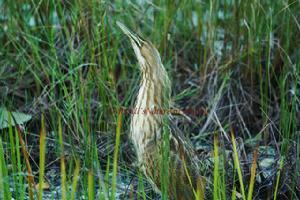 Our American bittern is still feeding in the marsh near the end of the drive. Of course, whenever we are trying to film it, cars come along. Unfortunately, there is no place to pull off so�..we end our drive and our time on the Refuge till next week. We woke up to a foggy morning so we waited for it to lift which was around 9:00am. The sun was shining as we went by the South Show Pool where a pair of Sandhill cranes was frolicking in the water along with trumpeter swans and Canada geese. 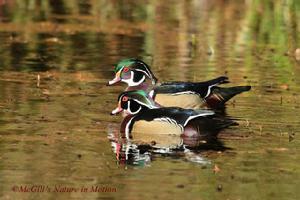 Several male wood ducks were feeding in the small pool in front of the Visitors Center. I was able to get a few shots of them before they flew off. A pair of trumpeter swans with their one almost grown cygnet was feeding in F Pool just as we entered the Marshland Drive. Another pair of trumpeter swans was resting on an island in F Pool with their two almost grown cygnets. 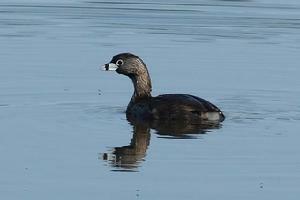 A little pied billed grebe was playing submarine in F Pool as we turned on to the Fishing Loop. Canada geese were pool hopping from E to F Pool. 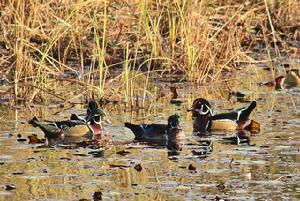 Lots of wood ducks were feeding in the corner of E Pool on the Fishing Loop. It was unusual not to hear the young osprey screaming from their nest, begging for food from their parents. The parents have left them to fend for themselves while the parents are off to South America for the winter. The kids have to find their way south on their own. It is a dangerous journey even for the adults. We have more pied billed grebes on H Pool along with lots of noisy Canada geese. As we head down the H/G drive we spot an eagle take off out of tree near the drive. It landed in a pine tree on G Pool to continue its hunt. 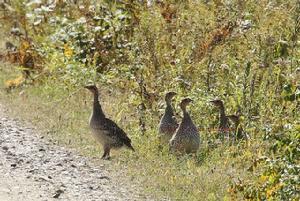 Just as we get to G Pool we spot of covey of sharp-tailed grouse feeding along the drive. We manage to get a few shots off before they fly into the scrub. We spot a doe swimming across G Pool to a small island. Once she made it to the island she went and laid down behind some brush. It made for a safe haven from predators. An osprey is trying to fish on G Pool as yet another eagle takes off out of a tree around the corner on G Pool. It is the pair that has the nest on G Pool. As they head to the nest we can hear �junior� still crying to be fed by its parents. Sandhill cranes are cackling and flying all over the place! As we near G/D spillway we have one Sandhill crane chasing another pair. We find out that around the corner is its mate with a colt which just flew out of a tree!!! Honest!!! Unfortunately I couldn�t get my camera on it till after it had launched itself from the tree. Sweet!! Our little pied billed grebe family is still hanging out around the E/D spillway as an osprey flew out of tree on E Pool. It headed over to D Poll but disappeared. 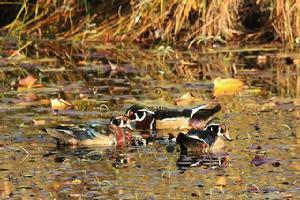 We have lots of wood ducks on C Pool but they are back in by the reeds. We did catch a few that were sleeping on a little spit of land further down the pool. Our little pied billed grebes are scattered all down C Pool. I love to watch them submerge themselves like a submarine. We also have quite a gathering of ring-necked ducks, males and females, on the east end of C Pool. Around 11:00 the clouds blow out of the area just in time for us to film and shoot a couple of American bittern in the marsh near the end of the drive. It was fantastic!! The one hunted and hunted without giving us a second glance. It was so nice we decided we had better make another run through before we lost the sun again. Once again we got a few shots of wood ducks. Then on F Pool we had a swan fight going on as a juvenile bald eagle soared above us on F Pool. 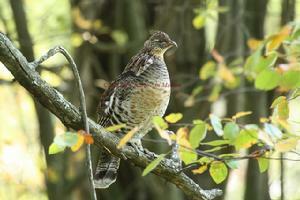 Michael spotted a ruffed grouse (partridge) roosting on a tree branch. We were able to shoot it for quite a while before another car came along and spooked it. Nice shots!! Our pied billed grebes were still on H Pool where we also spotted another American bittern hunting near the edge of the marsh. 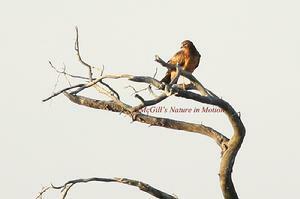 As we started down by J Pool a juvenile eagle took off out of a dead tree where it had been hunting. I hurried to catch up with it. It was soaring over J marsh when another eagle soared over to it. Sweet!! That eagle was starting to go into its 3rd year molt!! It flew into a dead tree up around the corner so�we crept up to a safe distance so we could both get some shots of it. 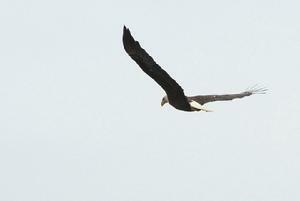 As I was shooting it I saw it was an Upper Peninsula banded eagle and that it was a female. My summation was that it was Princess, who was born and banded on the Refuge in 2009. We saw her last year, too. It is nice to know she is still in the area. As we were heading down the H/G drive we spotted another ruffed grouse feeding along the drive. It eventually went into the scrub and disappeared. The sharp-tailed grouse were back near G Pool. This time I was able to get a shot of at least five of them together. They went into the scrub down by the water. I was able to get a shot of one peeking through the brush. The rest of the drive was much the same pied billed grebes, trumpeter swans, Canada geese, ring necked ducks and wood ducks. And there again at the end of the drive in the marsh was our two American bittern hunting!! We were able to get some more great shots. The lighting was perfect!! It was 3:00 and time to get a bite to eat. We spotted three separate American bitterns on the Fishing Loop along H/F marsh!! Pied billed grebes on J Pool were near the fishing deck. The rest of the drive was nondescript. The clouds were moving in quickly from the south devouring the last rays of sunshine from the sky. It�s a foggy, soggy day with mild temperatures in the 60�s. 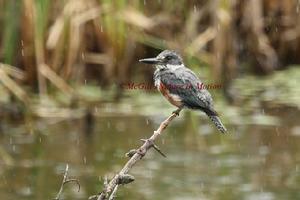 Even in the foggy drizzle the wildlife at Seney National Wildlife Refuge is gorgeous! 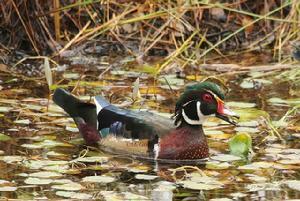 The male wood ducks are feeding voraciously in the small pool in front of the Visitors Center. The males are in their Fall breeding plumage. 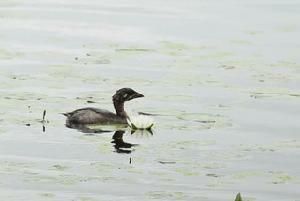 The pied billed grebes are enjoying their independence from their parents. They dive and submerge like submarines as we pass by. They are so darn cute!! We take our favorite drive, the Fishing Loop, for the last time this season. When we come back next weekend it will be closed for the season as of October 1. So we will go slow and savor the landscape ad wildlife. 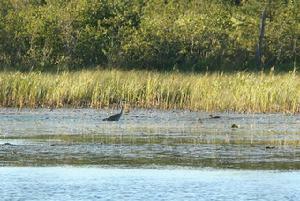 A pair of Sandhill cranes is feeding on an island in J Pool. It is pretty quiet on the H/G drive. Another pair of Sandhill cranes is feeding in the low water on G Pool. A quiet kingfisher is fishing along the edge of G Pool. Our little pied billed grebes are still scattered along the west end of E Pool. One of the juvenile eagles is hunting from a dead tree on an island in E Pool. More wood ducks are feeding on D Pool where the trumpeter swans are. 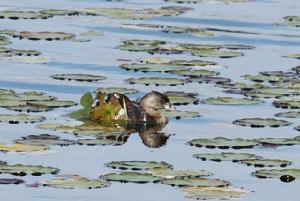 Wood ducks are in their usual spot on C Pool. 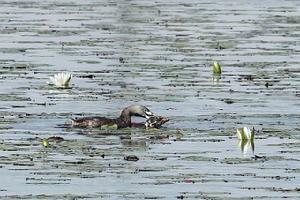 Pied billed grebes are scattered all along C Pool. Further down a merlin is hunting in B marsh. An osprey is hunting from a dead tree at the edge of B Pool. 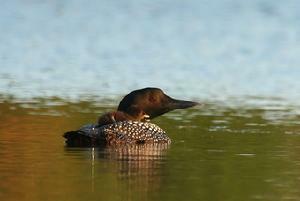 The juvenile loon is still on C Pool resting up for its long journey into adulthood. 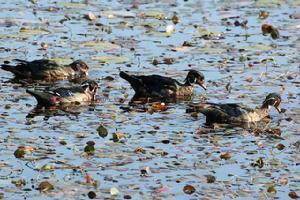 More wood ducks are feeding on the east end of C Pool. 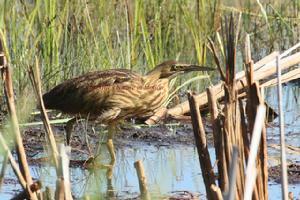 The American bittern is still feeding in the marsh near the end of the drive. And as we head to the Wigwams we spot a great blue heron fishing on the South Show Pool. 12:15 we decide to make another run through to check on the eagle that we saw sitting in one of the dead trees along the Marshland Drive. We are in hopes that it will still be there. We spotted it across from C Pool around 11:30. Michael was able to get some footage of the wood ducks this time in the small pool in front of the Visitors Center. Princess is still sitting in the same tree after almost two hours. 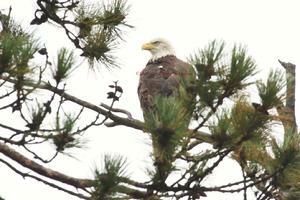 And luck for us the female bald eagle from E Pool is still in the dead tree on the Marshland Drive. Yeah!! 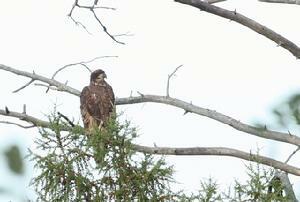 We are both able to get some footage of her before she takes off to B Pool to sit in a tree near the old eagle nest. We have a gathering of ring neck ducks toward the west end of E Pool. Princess has now moved to a dead tree on G Pool which we could see from the Marshland Drive. Lots of wood ducks feeding at the west end of E Pool, too. Wood ducks, pied billed grebes and trumpeter swans are the most plentiful creatures right now on the Refuge. We call it a day at 2:00 to pack up and head home only to return again Saturday!! Actually we are going to go through Rudyard to check on the Sandhill cranes to see if they are staging yet before heading home. We headed over to Rudyard on our way home to check out the Sandhill Cranes. We were rewarded with finding several hundred feeding in their usual area. We filmed them for almost two hours. The sun had come out and made for a great end to our three day weekend. We will be back next Monday afternoon to see how many more have arrived to their Fall Staging area here. Crisp, clear Fall morning in the Upper Peninsula of Michigan at 26 degrees. 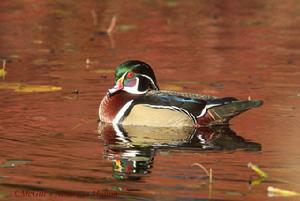 We have male wood ducks on the small pool in front of the Visitors Center. Good shooting with the sunrise shining on them. Pied billed grebes and ring neck ducks on F Pool with a trumpeter swan pair and cygnets. The Fishing Loop is now closed for the season so on to the Marshland Drive we go. We are always sad because we miss H, J and G Pools now. E Pool had quite a large gathering of rind neck ducks on it along with wood ducks scattered here and there. We even spy a male hooded merganser near the swan observatory. We have a loon flying over C Pool. Muskrats are busy gathering sweet grass. More pied billed grebes and ring neck ducks toward the west end of E Pool. D Pool is fairly quiet with just a few trumpeter swans and geese gathered. C Pool has less wood ducks then usual but still quite a few pied billed grebes. All in all it was a quiet morning on the Refuge. We didn�t see any signs of the bald eagles which is strange. They must be hunting on the Fishing Loop. LOL! We decided to take another quick run through since it was so beautiful out. Not a lot happening except traffic!! Wow lots of people are out enjoying the day on the Refuge today! We did spot a Northern Harrier hunting on C marsh. And surprisingly an American bittern was in the little dead pool on the east end of C Pool. 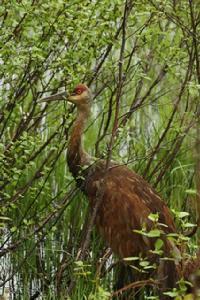 We haven�t seen anything in there since we spotted a great blue heron about ten years ago. We head out of the Refuge around 1:00 to take a break. We will make a evening run later. After a midday run to Munising, we spotted a little baby black bear killed along the road on M-28. So I e-mailed a photo of the poor thing to Sara just in case the Refuge wanted to use it for display. It was on the Refuge property. There wasn�t anything different except D Pool had a young loon on it feeding near the shore. We are off to the tracks of the Toonerville Trolley tomorrow. We headed into the Refuge around 9:00am to 58 degrees and mostly sunny beautiful fall weather. Our wood ducks were still in the pool in front of the Visitors Center!! We were both able to get some good shot of four males wooing a lone female. The morning sun made for great lighting on their gorgeous plumage! We had a pied billed grebe in F Pool popping up and down. A mature bald eagle was across the pool fishing from a dead tree. And more pied billed grebes were down by the Fishing Loop entrance on F Pool. We still have gathering of ring neck ducks on E Pool. A big beaver working on his winter food storage was further down E Pool where wood ducks were scattered, some feeding with the trumpeter swans. Of course, Canada geese are also scattered throughout the pools along with their local companions the trumpeter swans. Our families of pied billed grebes are still in their usual spots on C Pool. The wood ducks are definitely spooked and not quite as many as there has been. 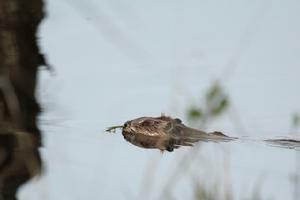 OMG a little pied billed grebe is trying to eat a small pike or bullhead. Amazing, it got the whole thing down! We head out of the Refuge around 11:00am to head to Toonerville to take down our �bear� blind for the season. We had an awesome experience on the tracks of the Toonerville Trolley when we took down our blind. Read my �Soo Junction Journal� to find out all of the details! We headed back into the Refuge at 5:30pm. Fairly quiet with the usual wood ducks, pied billed grebes, ring neck ducks, trumpeter swans and geese. We did have an eagle in its third year morphing into its 4th year plumage fishing on D Pool. Unfortunately, it spooked before we could get pics. As we were heading down C Pool I spotted a large bird on one of the dead trees on a small island. As we rounded the corner we found out it was a Northern Harrier!! I love that bird. We were able to get some nice shots of it. It seemed to be totally oblivious to us. It was a very pleasant way to end a great day of wildlife photography in the Upper Peninsula of Michigan!  We started out with a very foggy day so we didn�t head into the Refuge till around 10:00am. 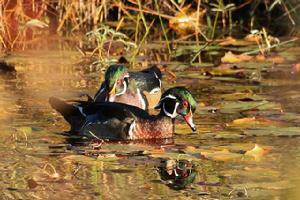 Our beautiful wood ducks were there to shoot in the beautiful morning fall sunlight. I have been very fortunate to be able to get some outstanding photos of these illusive creatures in their full breeding plumage! The Refuge is strangely quiet. The trumpeter swans are feeding with wood ducks around them. 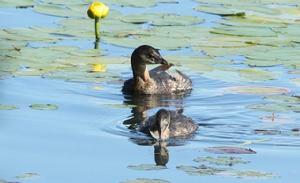 The pied billed grebes are still hanging out together as a family. There are still a few ring neck ducks together here and there. We were greatly surprised to see E Pool�s female bald eagle on the same dead tree that the Northern Harrier was in last night!! We got off some good shots before she took off to sit on E Pool and the Marshland Drive. We head into the Visitors Center to visit Pat and Sue. We have seen them lately because we have been on the tracks of the Toonerville Trolley. Luckily they weren�t really busy so we were able to visit. While we were chatting away Michael notice a coyote go by the back deck door. We tried to catch a better look but it had already disappeared down the nature trail. Pat was disappointed that didn�t see it. It has been hanging around the Visitors Center for a week or so. We said our good bye till next year. The Refuge officially closes on Sunday October 16 this year. So this was the last Monday our girls were working. As we were heading out of the Refuge, I spotted the coyote near the maintenance barn. We backed up and I was able to get some shots of it. 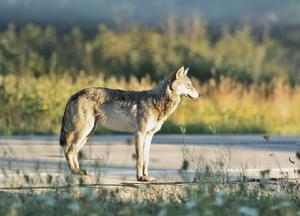 It is a very healthy looking coyote with its winter coat on already. It was another great end to our weekend at Seney National Wildlife Refuge. It is the final day of the season on the Refuge. We woke up to sunshine and wind with temperatures of 37 degrees at 9:15am. It was supposed to be raining today! I love it when the weathermen are wrong! Unfortunately, the wood ducks on the pool in front of the Visitors Center have all left. We expect it to be a quiet day but beautiful nonetheless. We do have a pair of wood ducks at the start of F Pool. The trumpeter swans with their two cygnets are feeding. Further down we have a pied billed grebe. E Pool has some mallards and lots of Canada geese feeding. As we round a corner we have an eagle flies out of a tree. We watch it as it lands in the �eagle� tree on the Marshland drive. We hope to get over to it before it flies off again. Michael stops so I can get a picture of it. Then�.bam�.it is gone! After looking at the photo we see it is the third year molting into its fourth stage of plumage we saw last weekend on D Pool. It didn�t stay long enough then to get a picture. Well, whatever the day brings, it was just nice to see one of these beautiful creatures up close and personal. Midway down E Pool we have another pair of trumpeter swans. 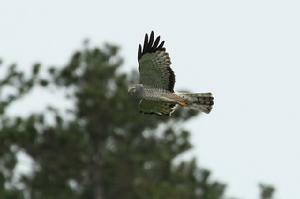 We also spot a Northern harrier soaring across the pool. On the west end of E Pool we have a gathering of ring necked ducks along with a female bufflehead and a male hooded merganser. A pied billed grebe is nearby, too. D Pool has a pair of trumpeter swans with two cygnets feeding, but not much else. C Pool midway has five male hooded mergansers who take off before we can nab a photo along with another group of ring necked ducks. Our little pied billed grebe families are scattered all along C Pool. We counted at least nine of them. They are so darn cute to watch. At the C/B spillway on C Pool we have a pair of trumpeter swans feeding. They are surrounded by five wood ducks. The wood ducks spook and fly over to the cove area further down the Pool. We approach the cove cautiously hoping to get a shot or two of the wood ducks before they take off. We find a pair of hooded mergansers in the same area. I did get a couple of pics before they took off. I decide to approach the cove on foot. The wood ducks are way back out of sight. Yeah! I was able to sneak up on them and get tons of pictures!! They finally spooked after about twenty minutes when they caught a glimpse of Michael out by the road filming them. A few more pied billed grebes, Canada geese and some mallards at the end of C Pool as we end our first run through the Refuge at 11:00am. We make one more run through while the weather is still holding out for us. There wasn�t a whole lot of anything different until we get toward the end of E Pool. We spot three river otters playing in the channel on the C side of the drive. Sweet! We were able to shoot a few pictures and footage of them as the two pups messed around and momma tried to make them mind. That helped make the last run of the season a memorable one. As we were ending the final run we spotted a merlin flying over the show pools and further down a wayward osprey that should be on its way to South America. It is always sad to have the season come to an end but we will be back in April for the Sharp-tailed grouse count at Seney National Wildlife Refuge in the Upper Peninsula of Michigan.